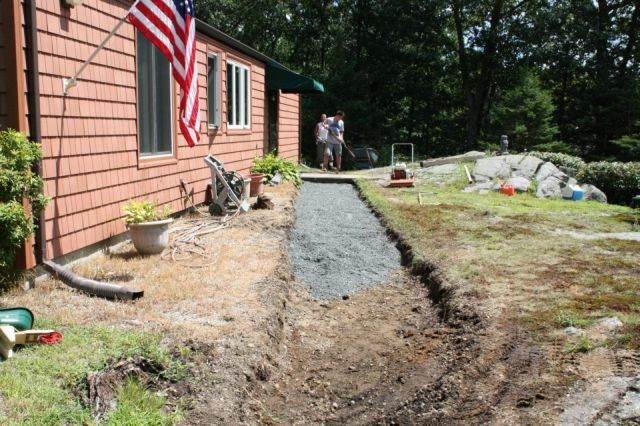 Using the tractor, we brought in over 20 tons of wall material (blocks and caps), over 25 tons of crushed stone and gravel, 250 sq. 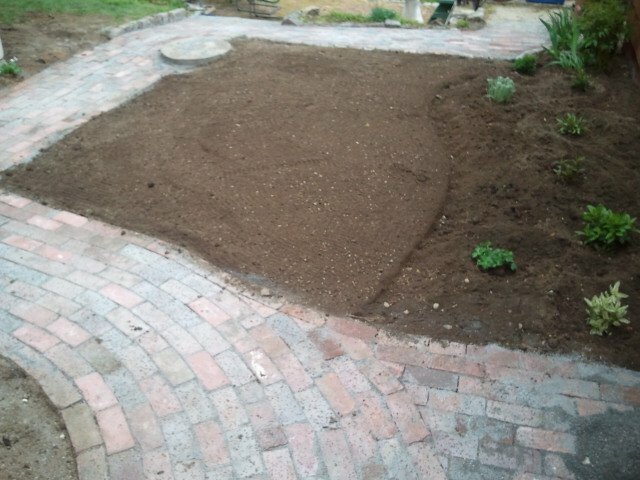 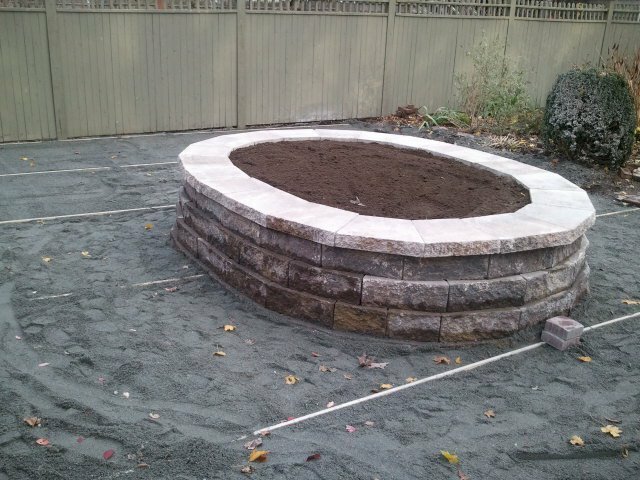 ft. of pavers, 125’ of cobblestone, loam, compost, plants, and mulch. 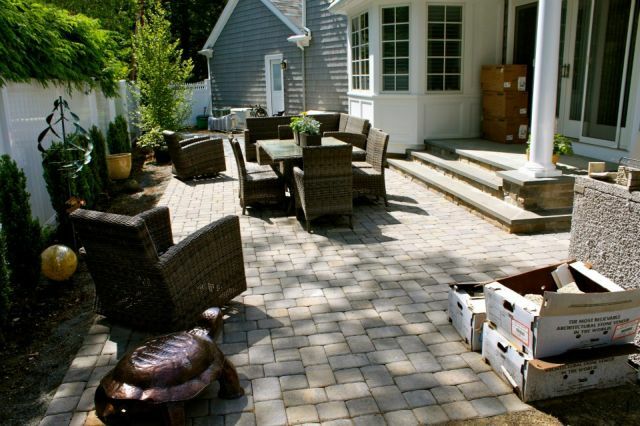 When complete, we had created an ‘oasis’ for our client, who in 20 years of living there had avoided, and in fact never used the backyard. 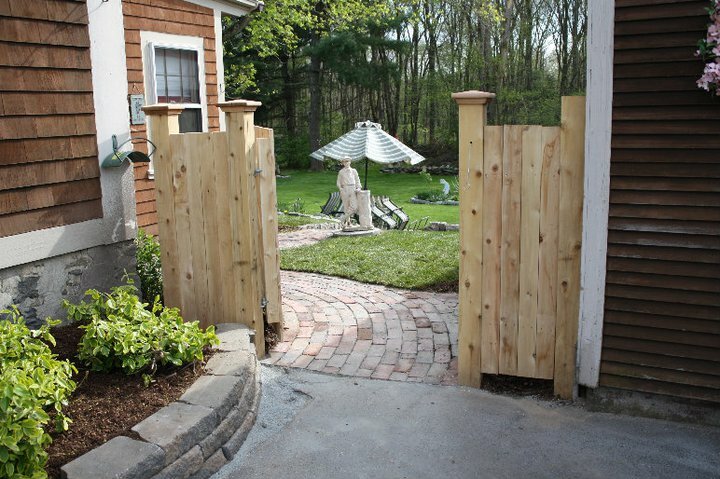 The grass between the two levels is a run for her dogs and the gardens and patio are now enjoyed throughout the year. 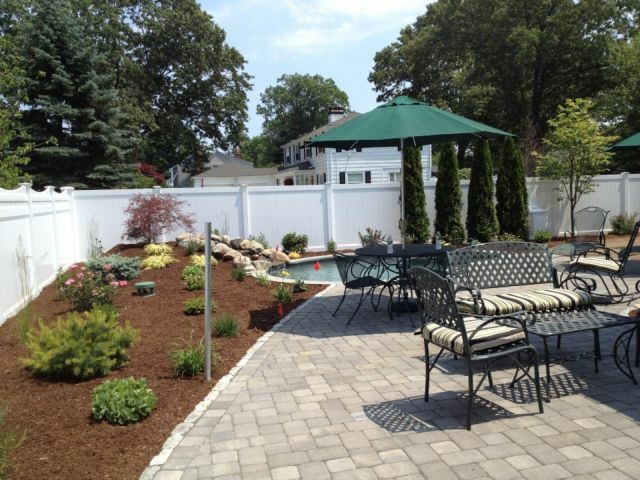 Plants included rose of sharon, myrtle, holly, fastigiate white pine, and western red cedar for the shade tolerance and beautiful evergreen foliage. 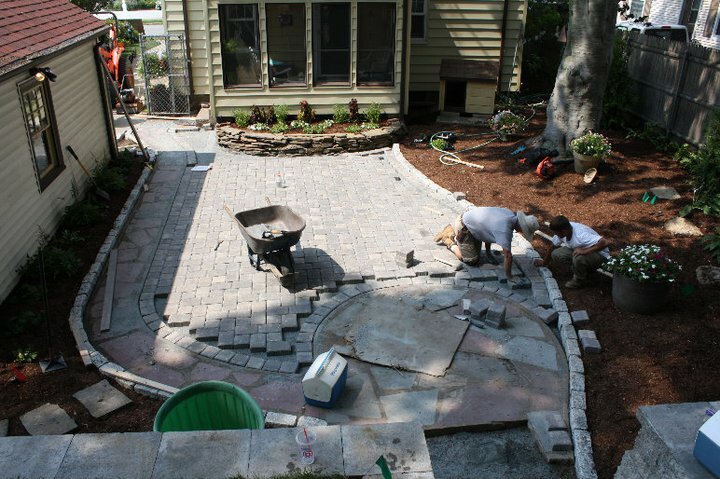 We were able to save and incorporate the original 1940’s flagstone into the new paver patio edged in cobblestone. 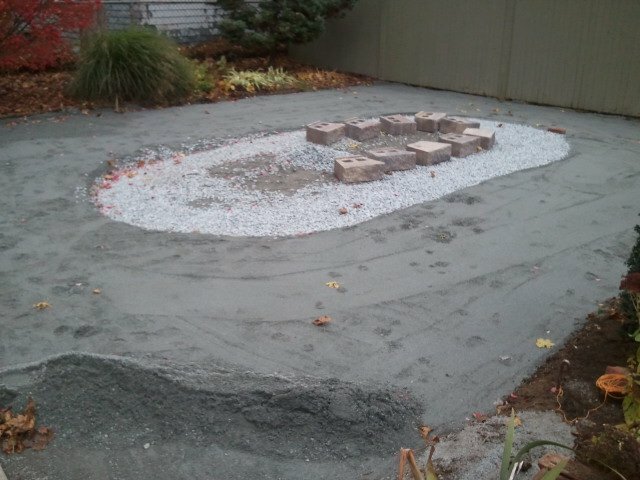 This was the most challenging landscape project I had ever undertaken. 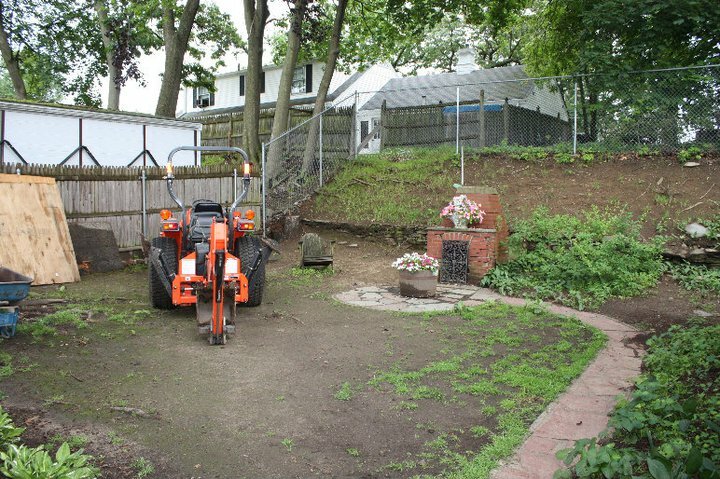 The limited access into the backyard, the extremely small space within which to work once we were in the backyard and the amount of material that needed to be brought into this small space all contributed to making this a difficult and demanding project. 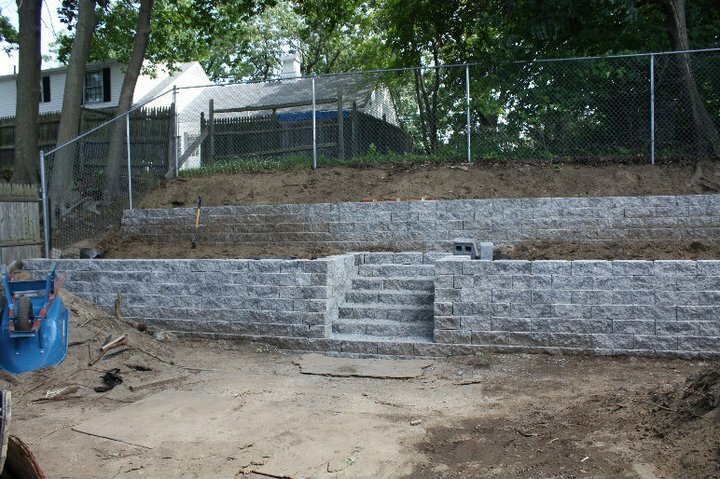 The two-tier retaining wall was built using a textured block segmental wall system with a set of stairs built into the first or lower wall. 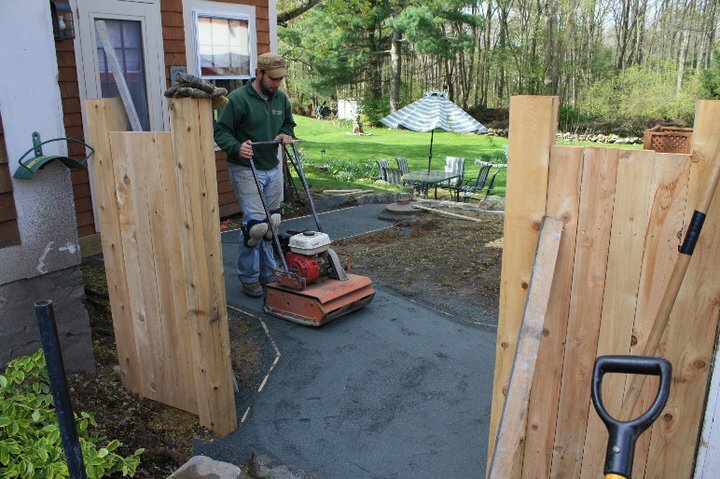 The opening between the corner of the garage and a fixed/permanent post was just large enough to allow our 5ft wide Kubota tractor-backhoe to fit through on an angle with a couple of inches to spare on either side. 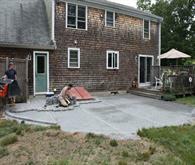 The backyard space in which we had to maneuver and work was less than 20’x25'! 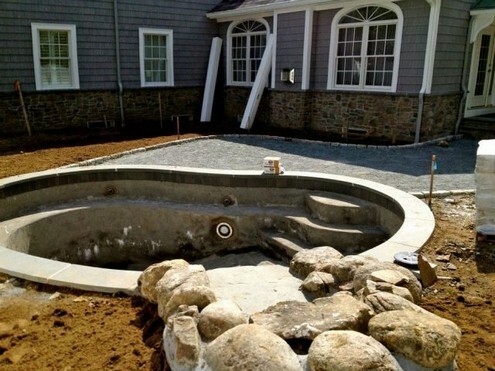 After the 23-foot diameter above-ground pool was dismantled and removed, I discussed with owners the idea of transforming the area into an outdoor living space. 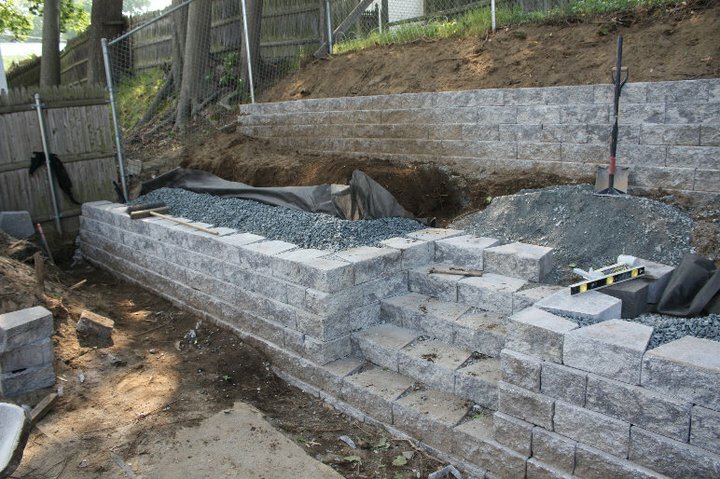 We built a sitting wall to retain the soil that originally sloped to the sides of the pool using a textured segmental block retaining wall system that enclosed approximately two-thirds of the perimeter of the patio. 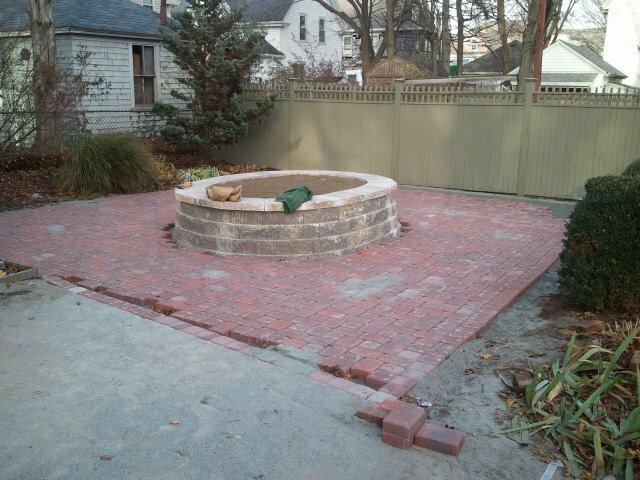 The patio was built with a concrete paver circular pack in a color to complement the wall color and surrounding natural features. 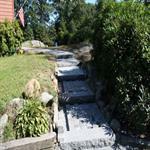 Granite steps were used to create a set of stairs from the lower lawn area to the front edge of the patio. 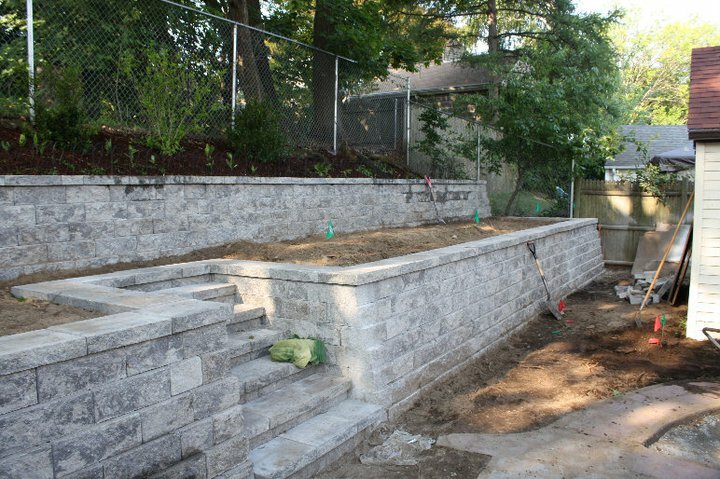 The 18” height of the retaining wall serves as extra seating as well as support the front face of a planting bed which wraps around the entire perimeter of the wall. 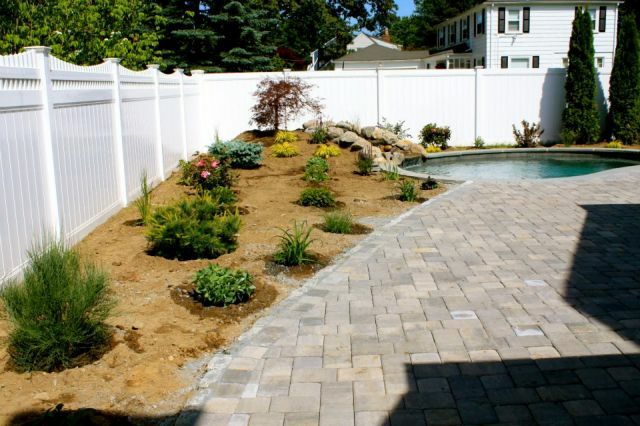 Shrubs, ornamental grasses and perennials were selected to provide color and foliage interest from late spring through the fall and include: hybrid spireas, endless summer hydrangeas, limelight hydrangea and knock out roses, coneflowers, Russian sage, dwarf daylilies and sedums. 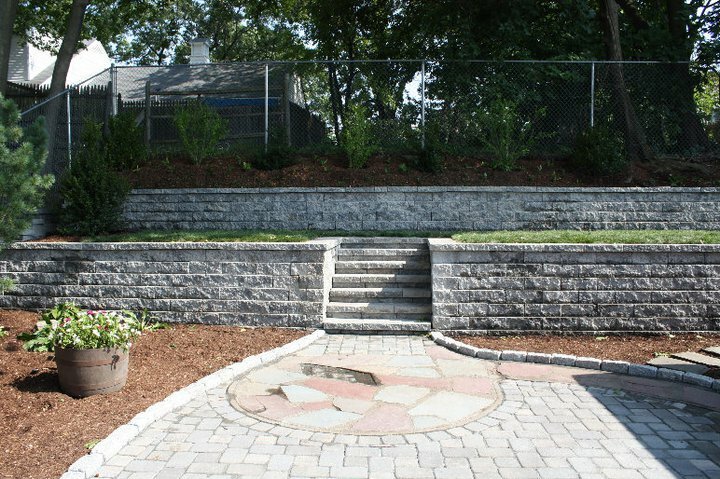 When completed, we had created an oasis for our client, who in 20 years of living there had avoided, and in fact never used the backyard! 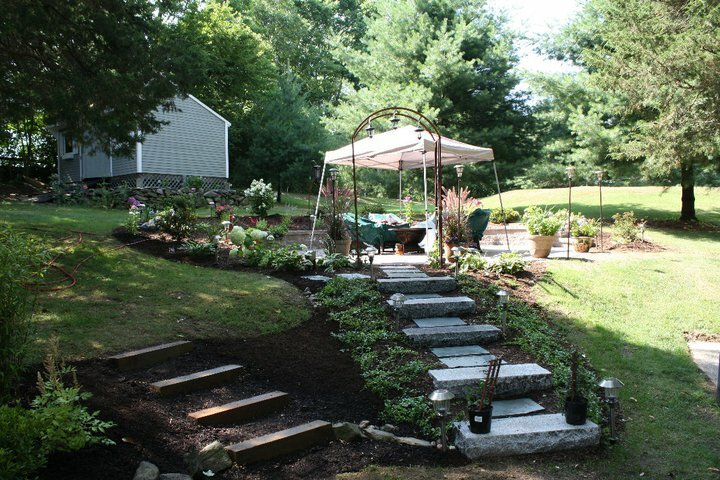 When properly planned, a small space, like the one pictured here, can include many landscape features and still have a nice appealing flow without looking too busy or cluttered. 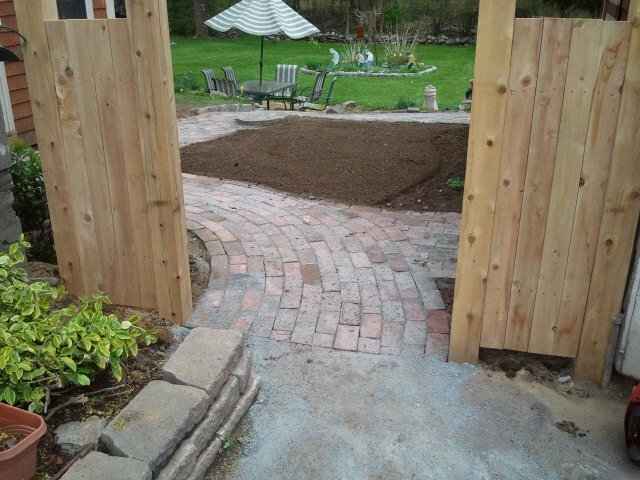 After removing an asphalt walkway, we installed several small paths constructed out of used brick, a perennial flower garden, a small patch of grass a mixed shrub border and a perennial garden. 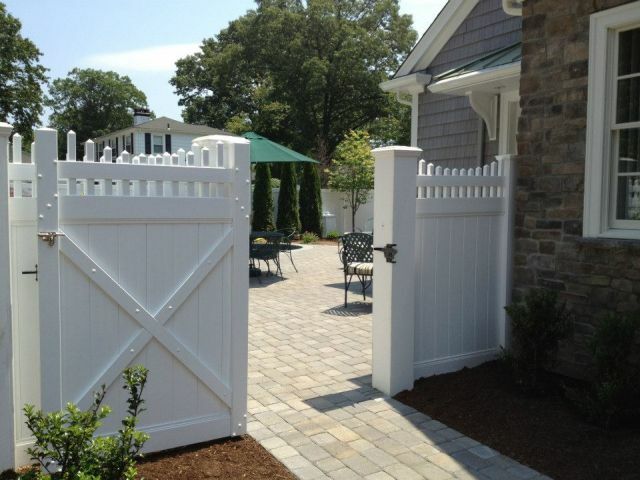 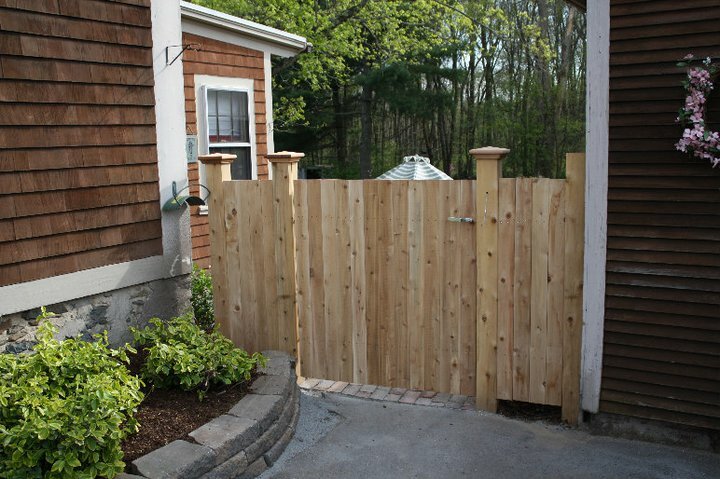 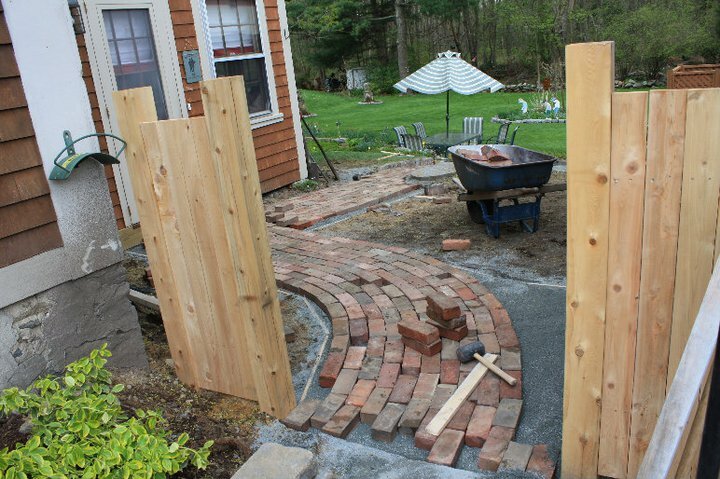 Upon completion of the garden space, we installed two small sections of fence and a gate to provide some privacy from the driveway and the busy route 118 beyond. 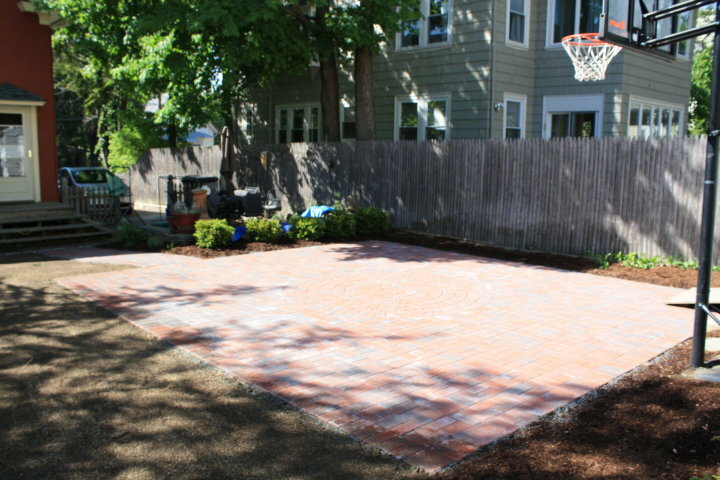 The used brick gives the yard a more rustic appeal and quite a bit of character to go along with the golfer. 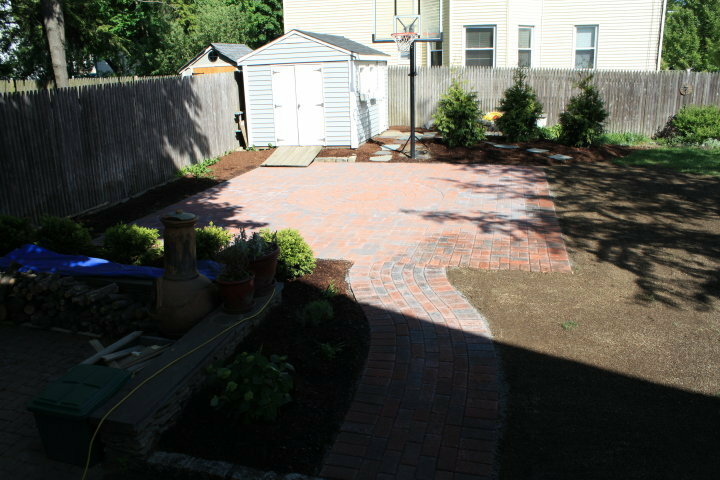 A small section of lawn was replaced with a raised planter that we built with a textured block wall system and a concrete paver patio. 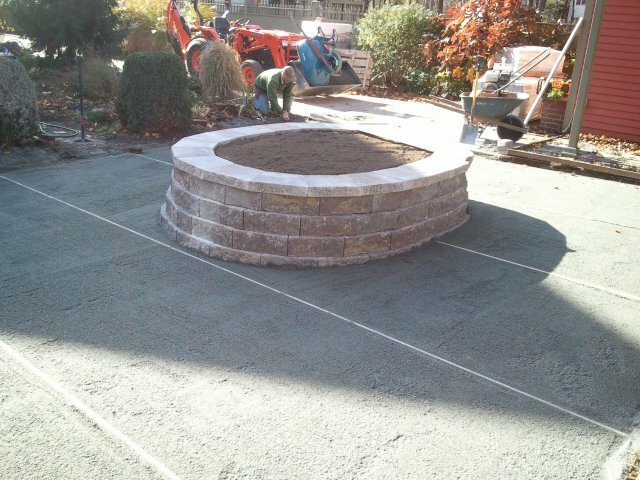 The planter will be used by the owner to grow herbs. 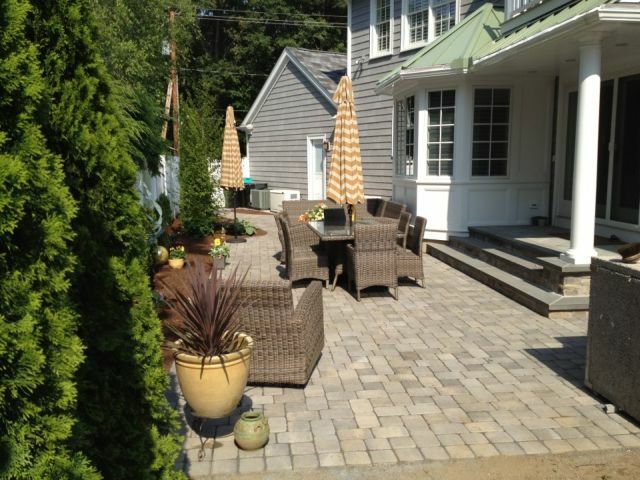 The concrete paver patio was installed around the raised planter to provide more outdoor living area. 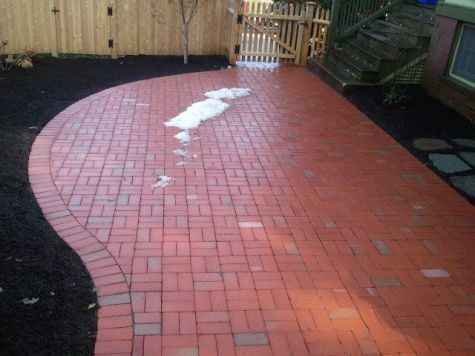 The color shades of both the wall and pavers were selected to complement each other while blending nicely with the surrounding landscape features. 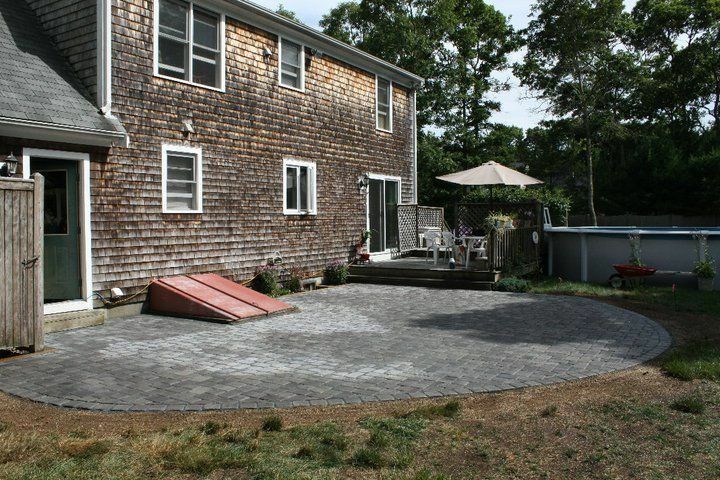 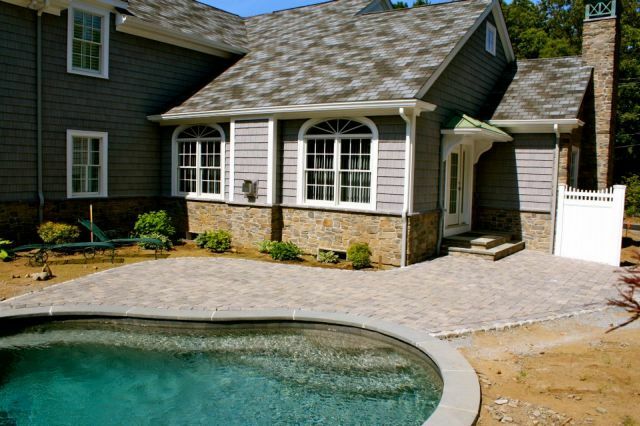 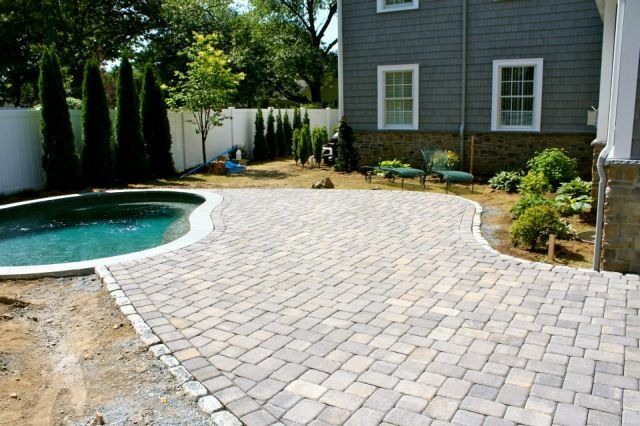 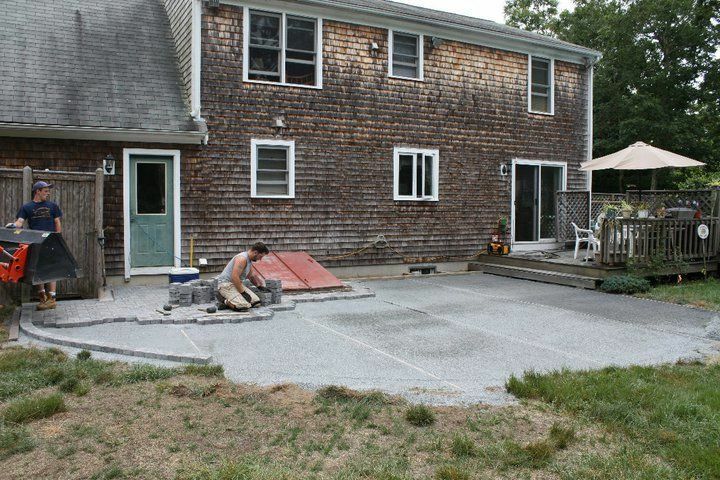 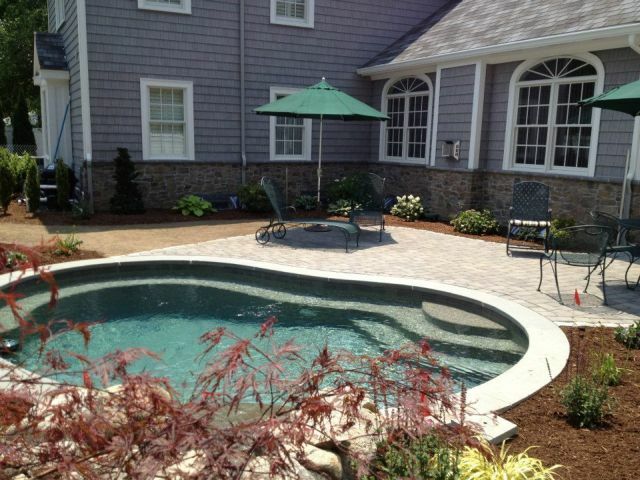 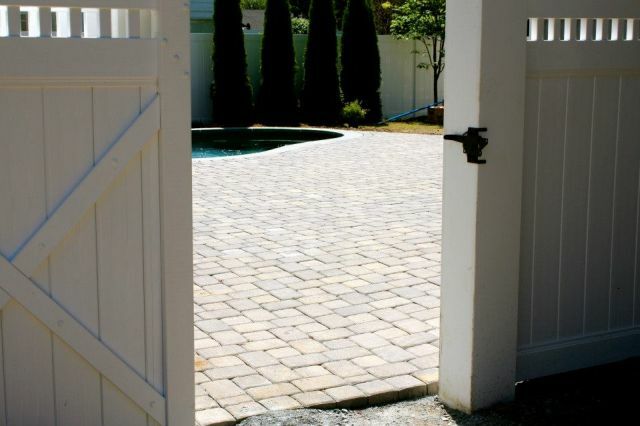 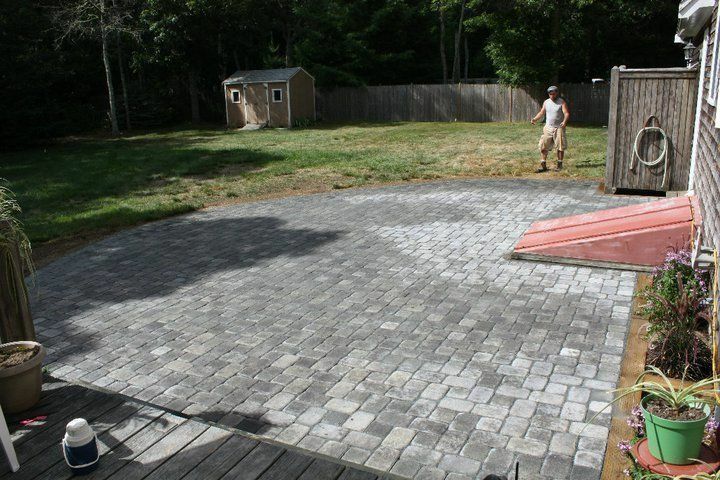 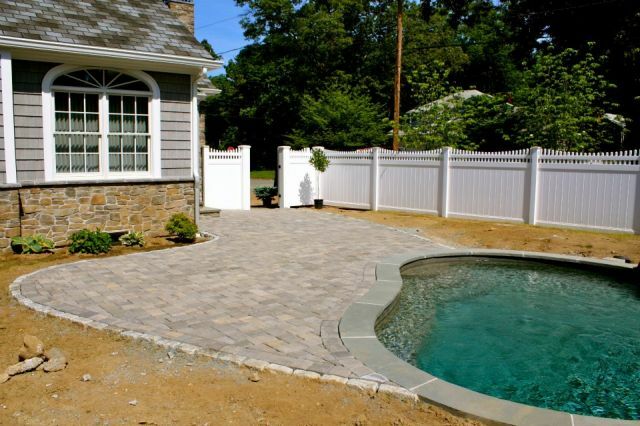 We travelled to the Cape to build this paver patio that connects to an existing deck off the back of our client’s house. 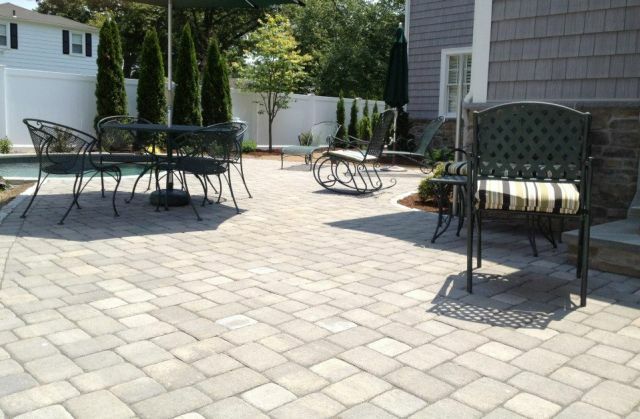 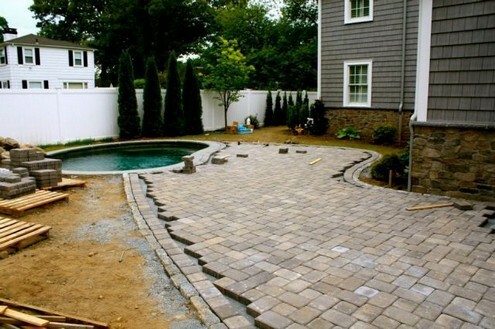 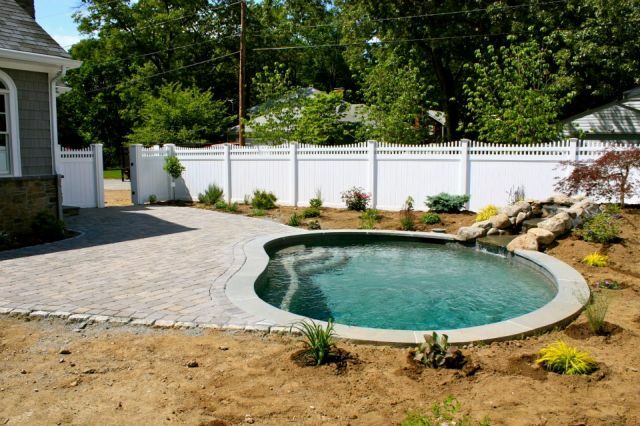 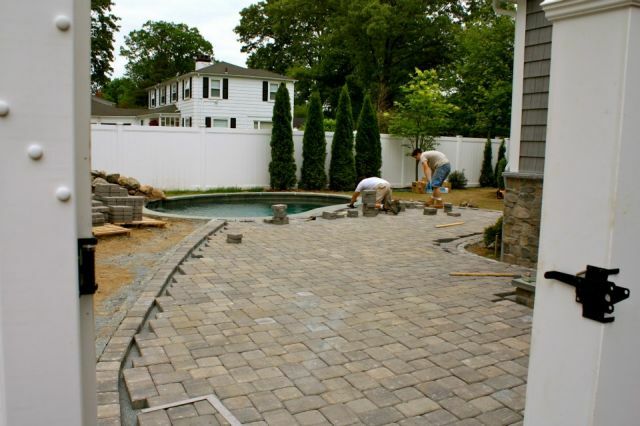 An attractive pattern using 6”x6” squares and 6”x9” rectangles was chosen using Belgard’s silex grey color. 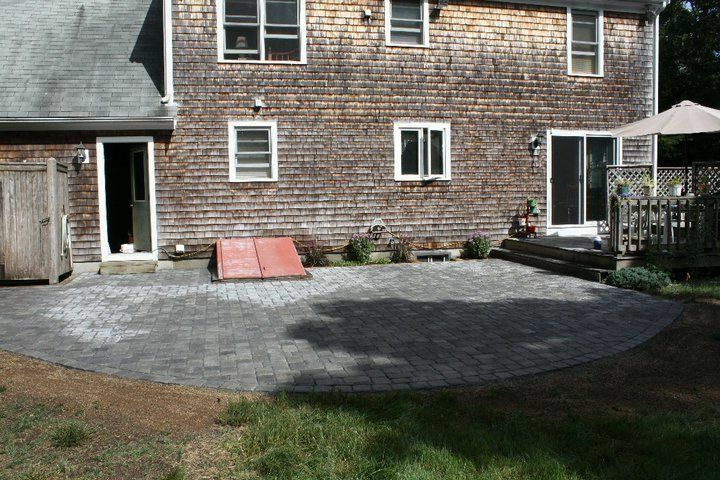 The patio provides additional space for entertaining if overflow seating from the deck is needed. 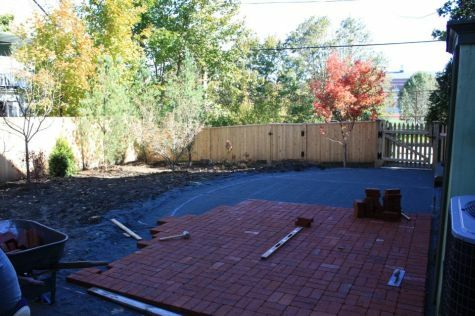 Our clients’ two boys were in desperate need of a basketball court better than the dirt and mud surface they were using. 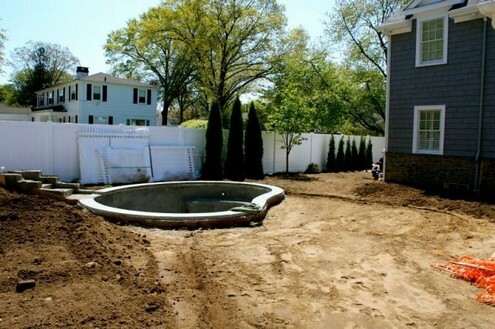 Their parents’ were hoping for additional outdoor living space. 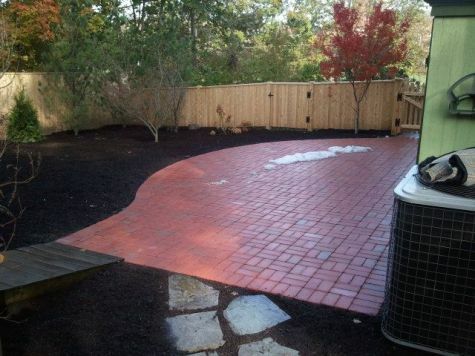 The patio we installed satisfies both needs. 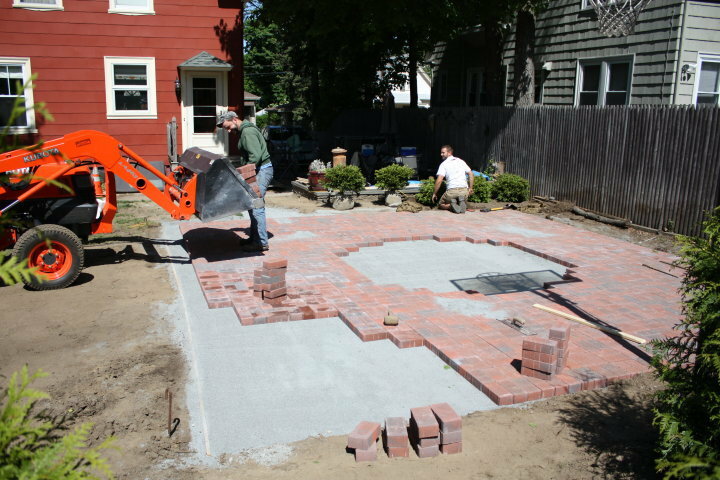 We chose a concrete paver with brick-like color in shades of grey and red and a paver size, 4”x8,” that replicated the size of a brick. 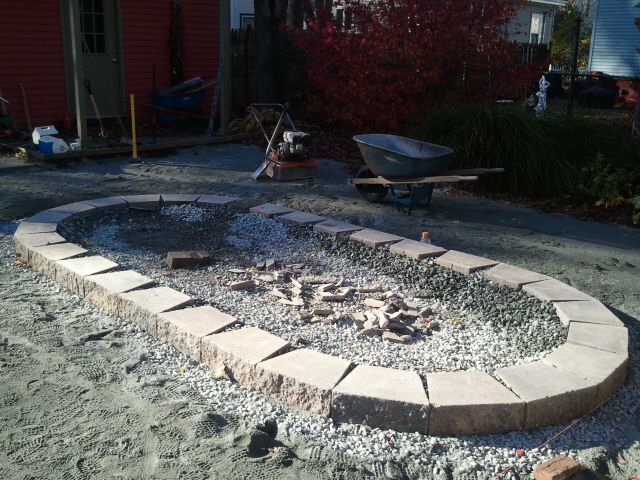 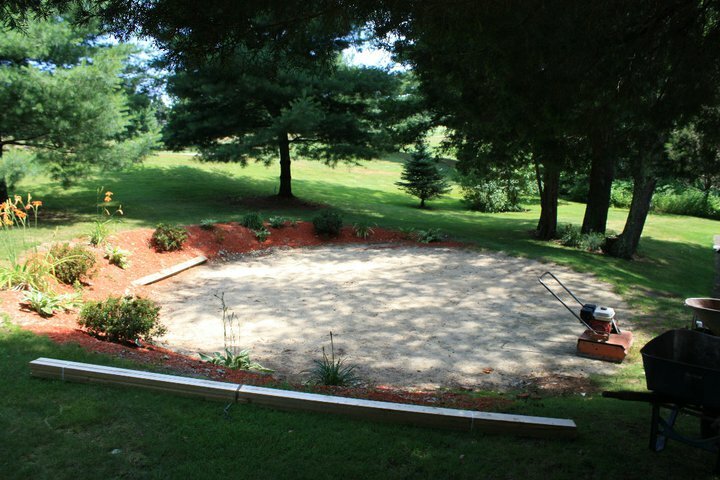 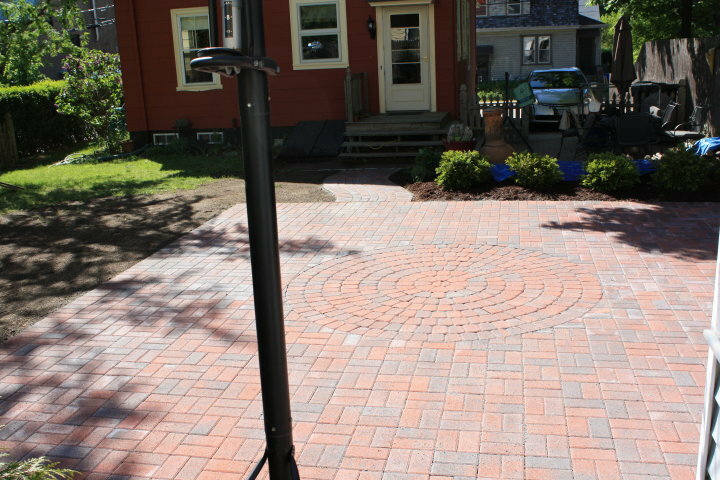 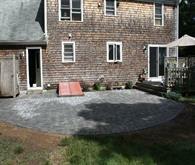 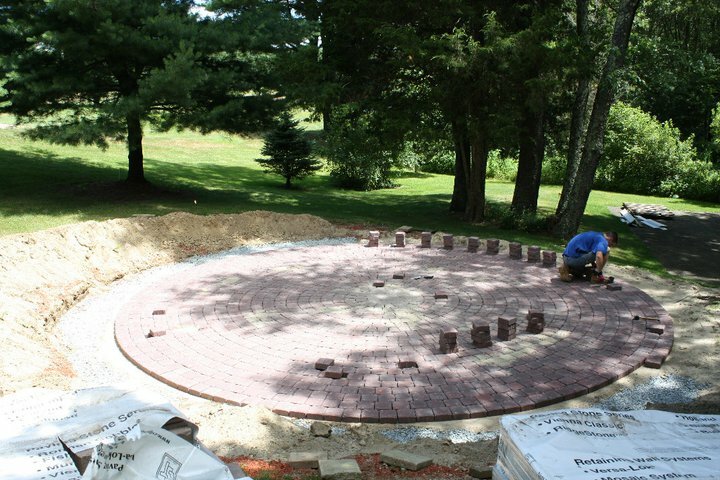 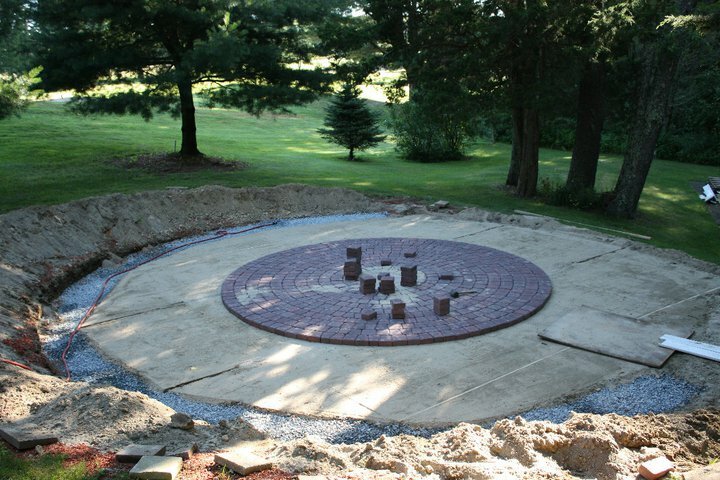 A circle pack was installed in the middle of the patio and serves as the ‘top of the key’ and ‘center-court’. 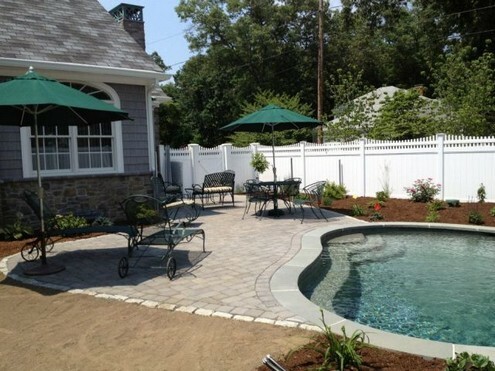 When not in use, the court functions as a patio and additional outdoor living space for entertaining and cooking out. When the boys are older it will permanently function as a patio. 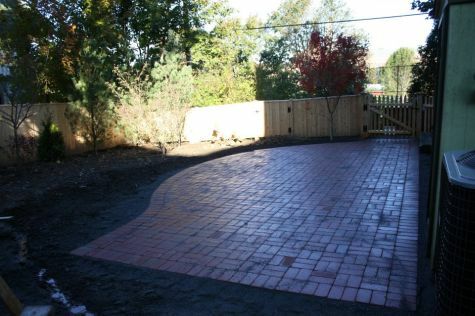 Using the same pavers, a short walkway was built connecting a smaller brick area to the new patio. 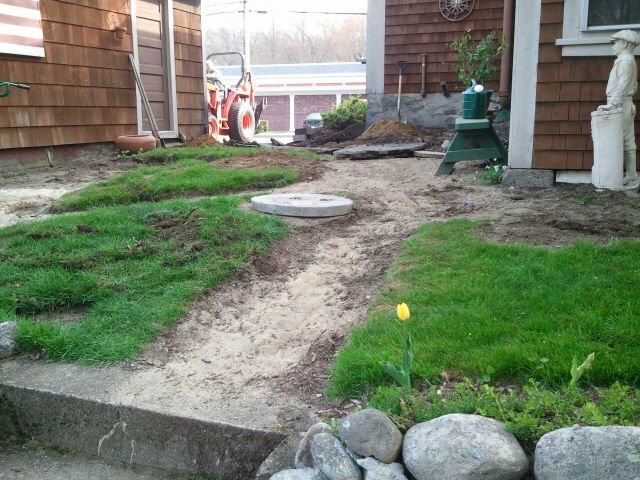 A small garden with Green Mountain. Boxwood and re-blooming daylilies was planted separating the two areas. 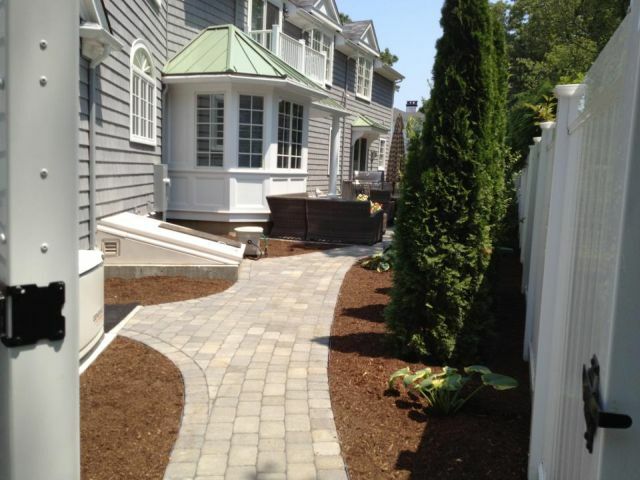 Evergreen had the pleasure of creating a landscape design around a new house on an empty lot. 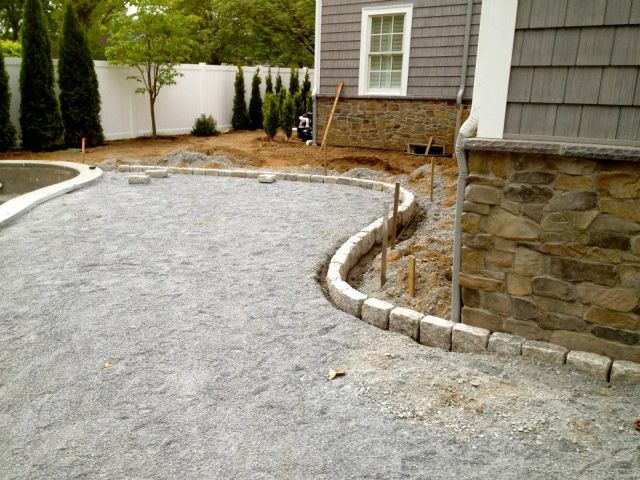 This was very exciting, as we worked with the homeowners to create a complete landscape that incorporated their needs and plant favorites as well as our professional design capabilities to ensure that when complete their entire landscape was filled with year-round interest, provided screening where necessary, functionality, aesthetically pleasing, and most importantly, it complemented the design of the house and its surroundings. 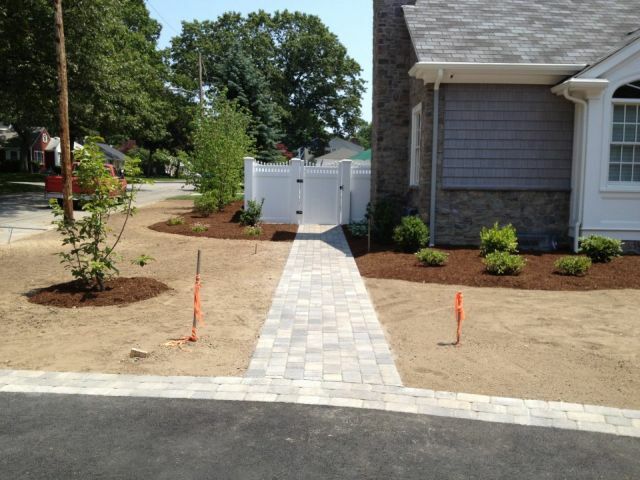 The project included concrete paver walkways, patios edged in cobblestone, an assortment of evergreens, flowering trees, shrubs, ornamental grasses and perennials, spreading of loam, all finish grading and the laying of sod. 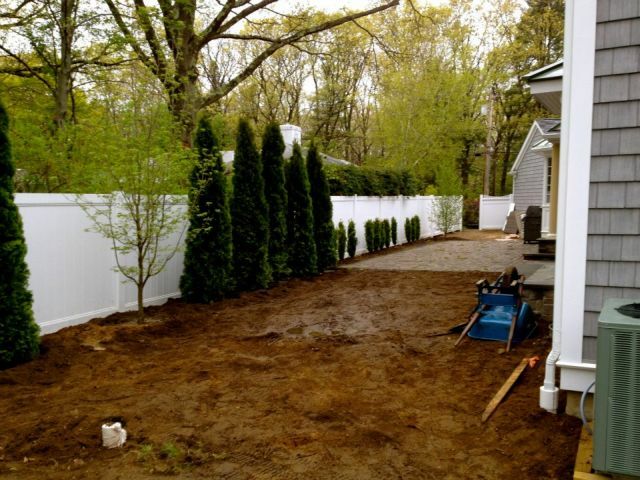 Tall, narrow and mature evergreens were used for screening in the back and side yards where space was limited. 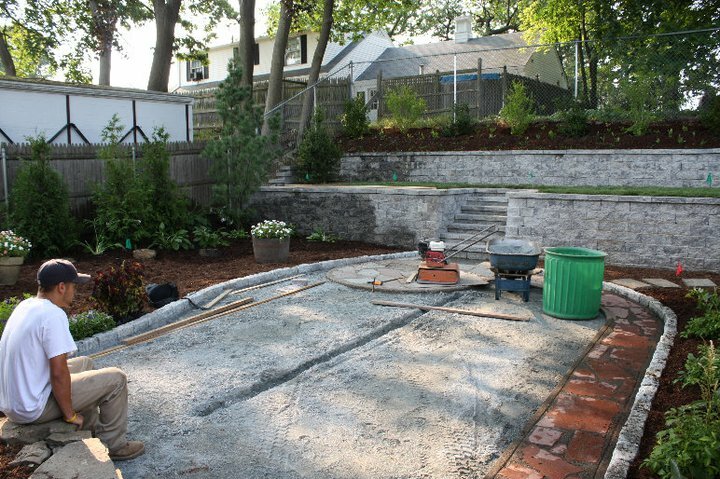 Views from inside the house were taken into consideration when selecting and placing plants in the landscape. 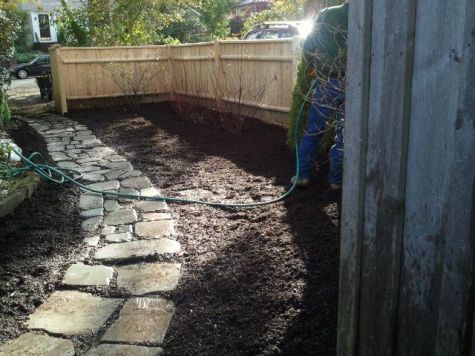 Overall it was a special project because we were involved from the beginning when there was just a house and dirt until the final piece of grass and wheelbarrow of mulch was laid. 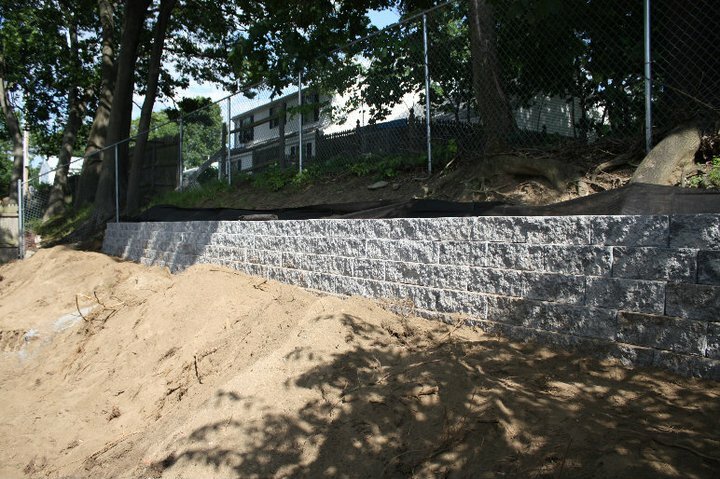 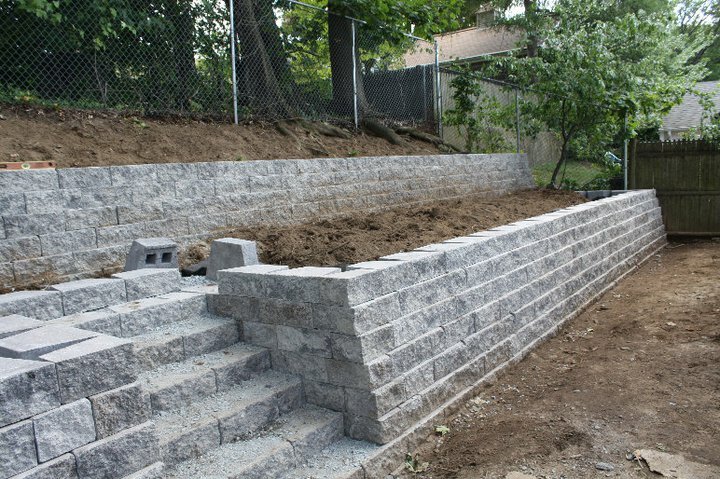 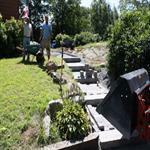 A textured block segmental retaining wall system was used to build a set of front steps. The original steps were made using landscape timbers and had deteriorated to the point where they were no longer safe. 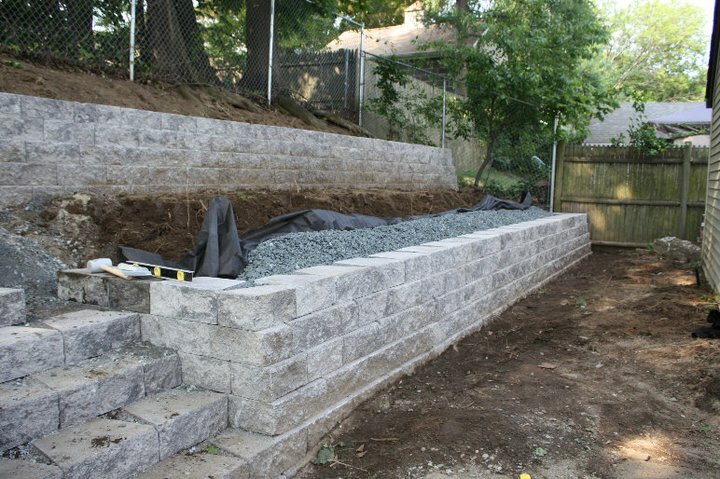 With the owners input, we selected a natural looking textured block wall using the caps for treads and designed an attractive and permanent set of front stairs for their home. On the same property as above we replaced a set of stairs leading from their driveway to the backyard. 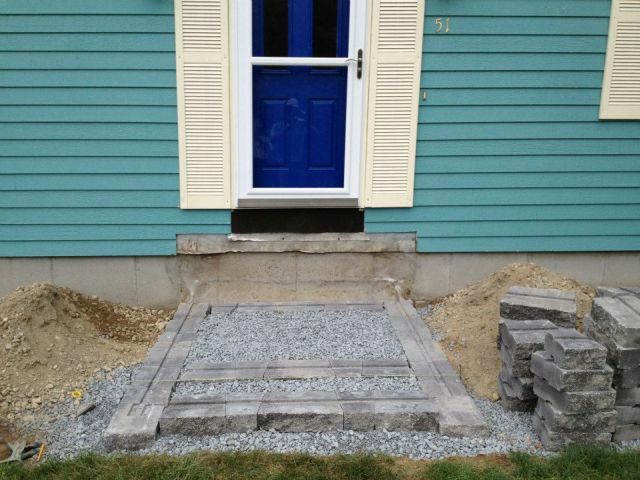 As can be seen from the before picture, the original stairs, like the front steps, were made using landscape timbers. 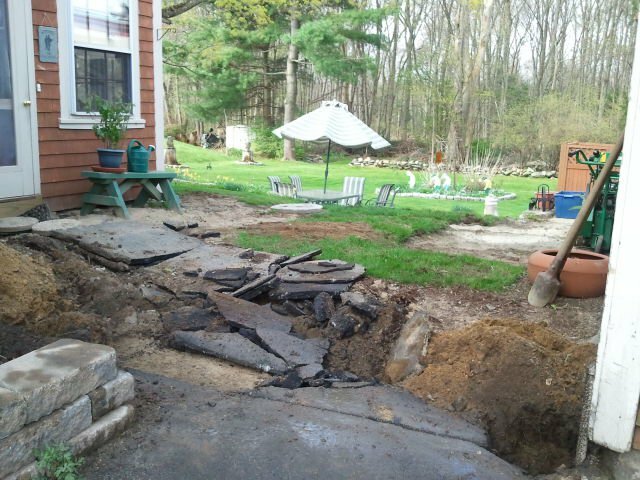 They also had rotted terribly and needed replacing. 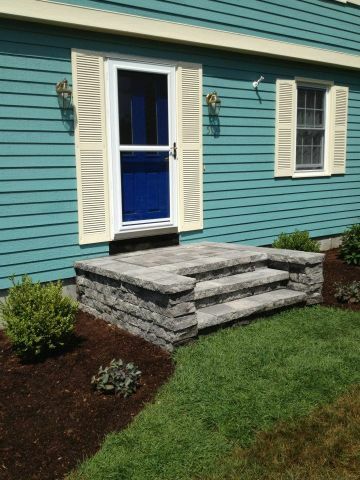 We chose to use the darker Caledonia granite steps (4 feet wide) to create the stairway, and a complementary grayish-blue colored paver to build a walkway from the top step to the deck off the back of the house. 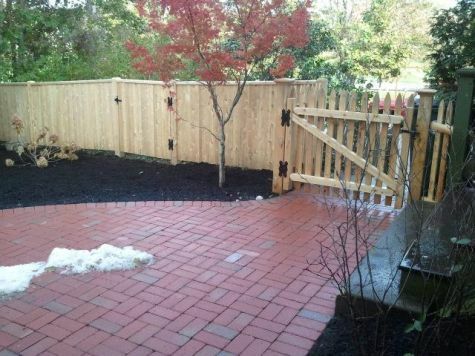 A late spring through fall garden was designed and installed between the walkway and the back of the house, the focal point of which was the small flowering tree - Japanese Snowbell. 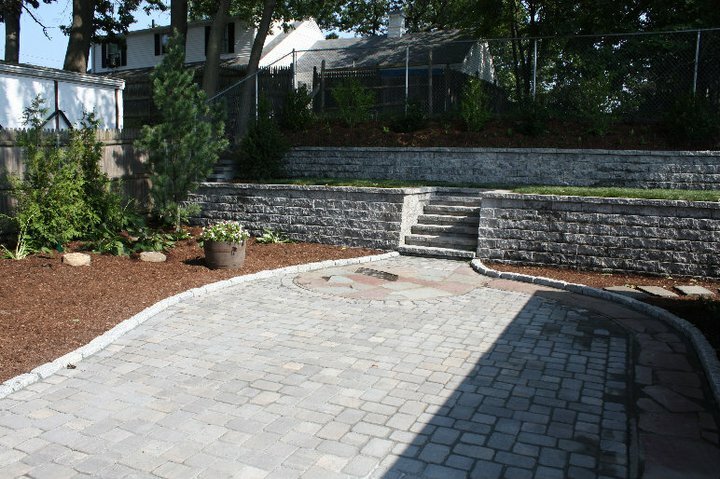 I chose this tree because when it blooms in June, the pendulous lily of the valley-like flowers hang on the underside of the foliage and is best viewed while looking up at the tree from a lower elevation, as will be the case when entering their driveway or climbing up the newly installed granite steps. 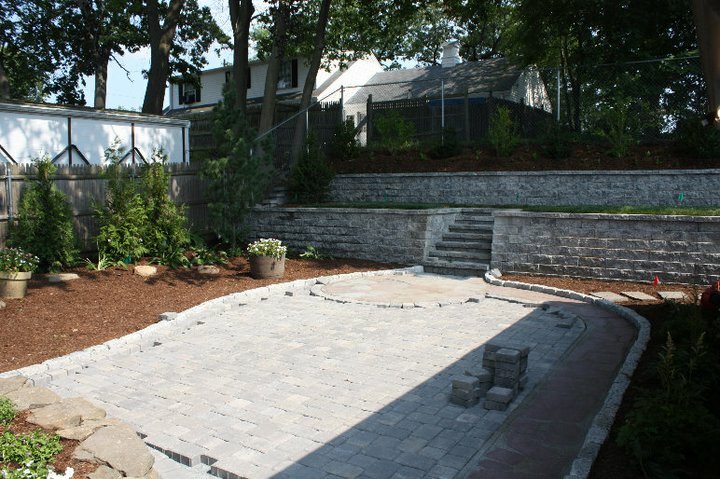 When completed, we had created an ‘oasis’ for our client, who in 20 years of living there had avoided, and in fact never used the backyard. 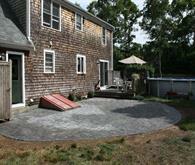 The grass between the two levels is a run for her dogs and the gardens and patio are now enjoyed throughout the year. 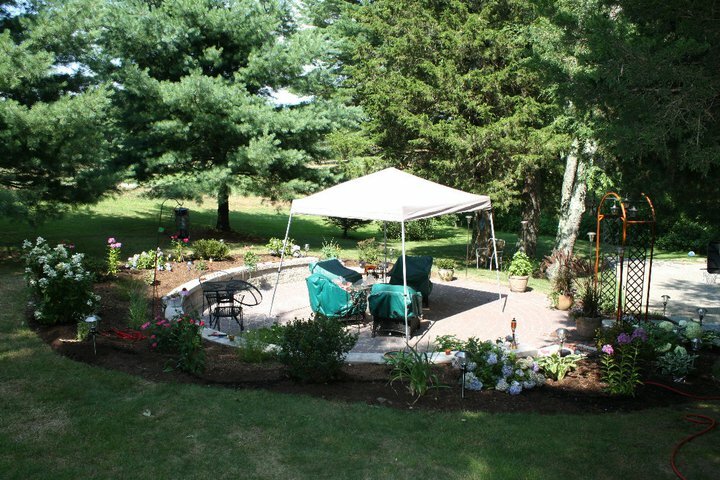 Plants included rose of sharon, myrtle, holly, fastigiate white pine, and western red cedar for the shade tolerance and beautiful evergreen foliage. 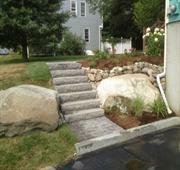 On this project we replaced a set of stairs leading from their driveway to the backyard. 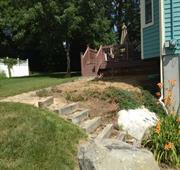 As can be seen from the before picture, the original stairs, like the front steps, were made using landscape timbers. 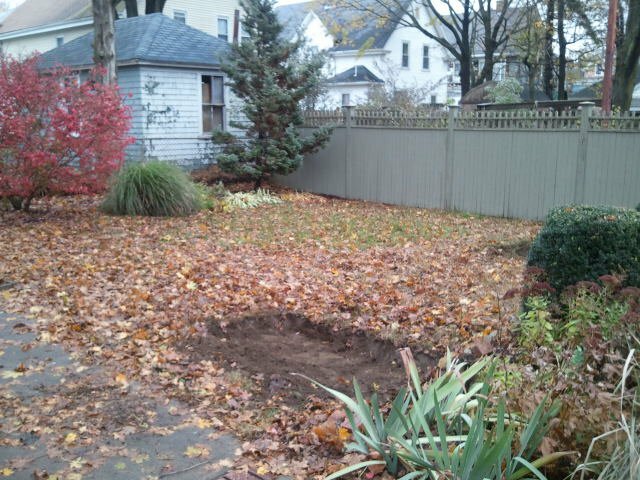 They also had rotted terribly and needed replacing. 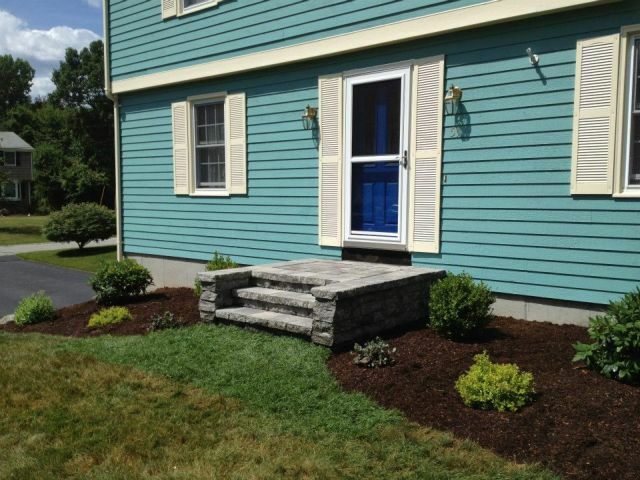 We chose to use the darker Caledonia granite steps (4 feet wide) to create the stairway, and a complementary grayish-blue colored paver to build a walkway from the top step to the deck off the back of the house. 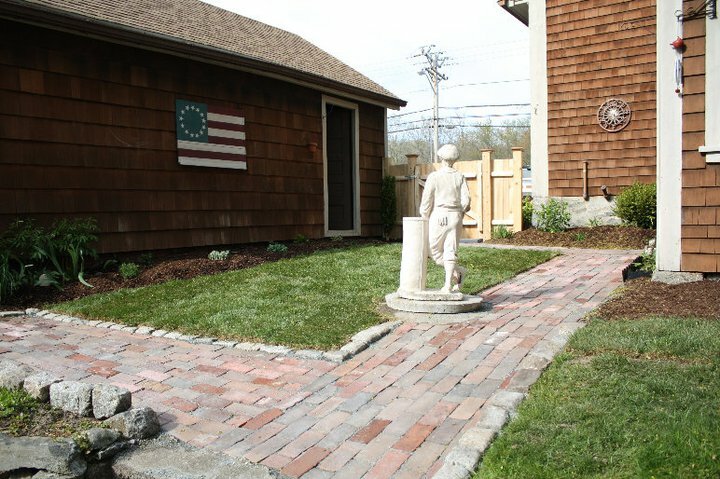 A late spring through fall garden was designed and installed between the walkway and the back of the house, the focal point of which was the small flowering tree - Japanese Snowbell. 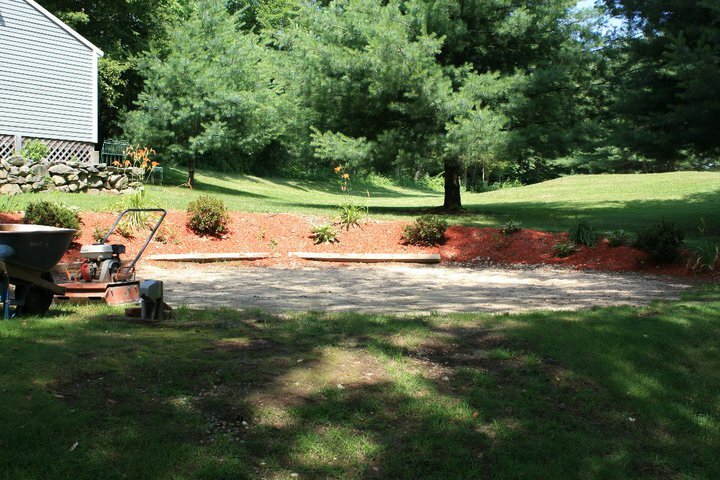 I chose this tree because when it blooms in June, the pendulous lily of the valley-like flowers hang on the underside of the foliage and is best viewed while looking up at the tree from a lower elevation, as will be the case when entering their driveway or climbing up the newly installed granite steps. 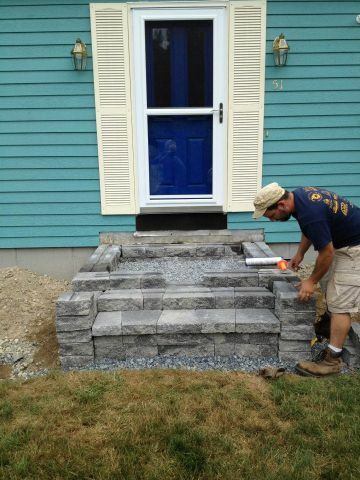 What can we build for you? 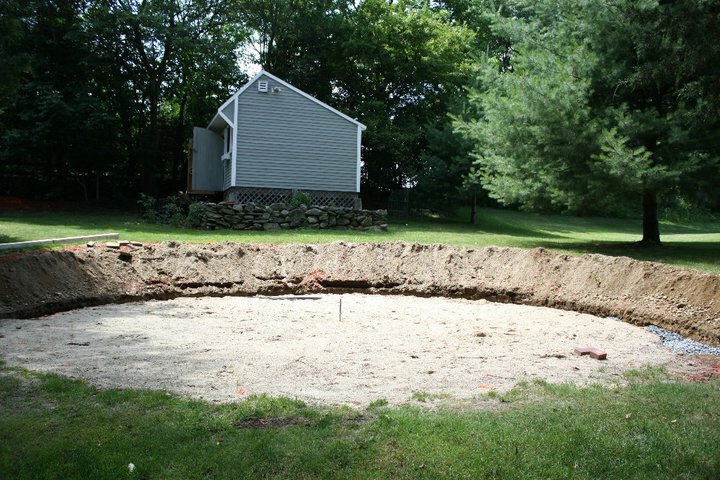 Contact Larry! 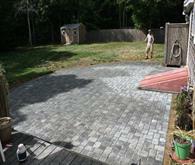 Here was another project where the before and after pictures tell it all. 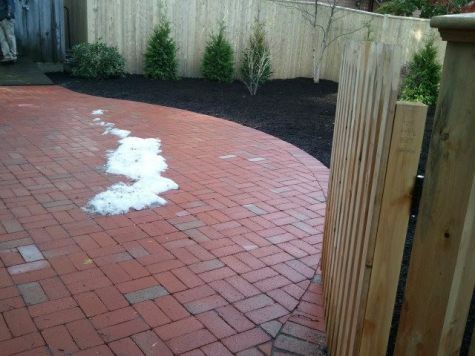 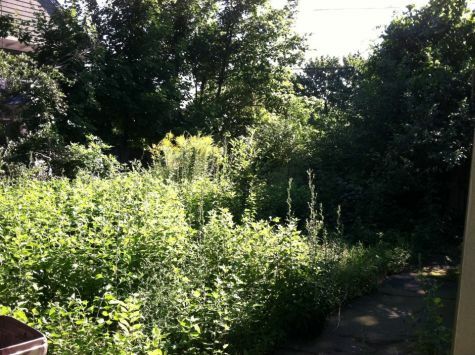 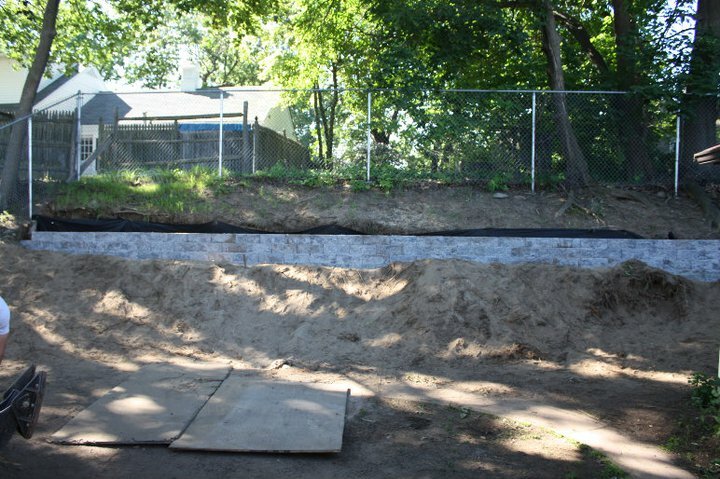 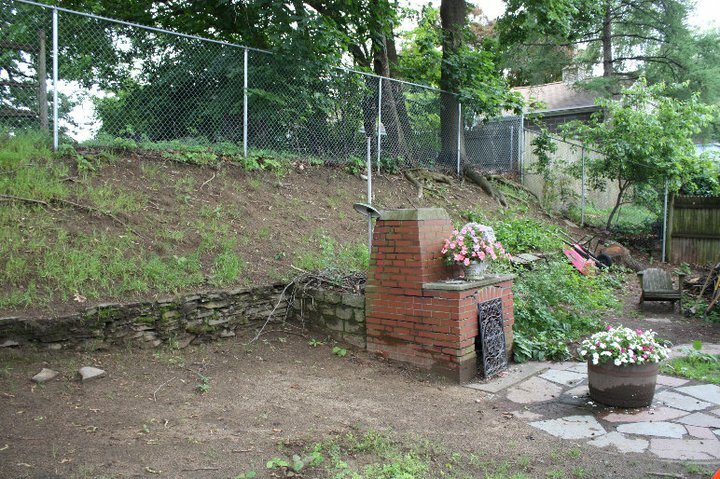 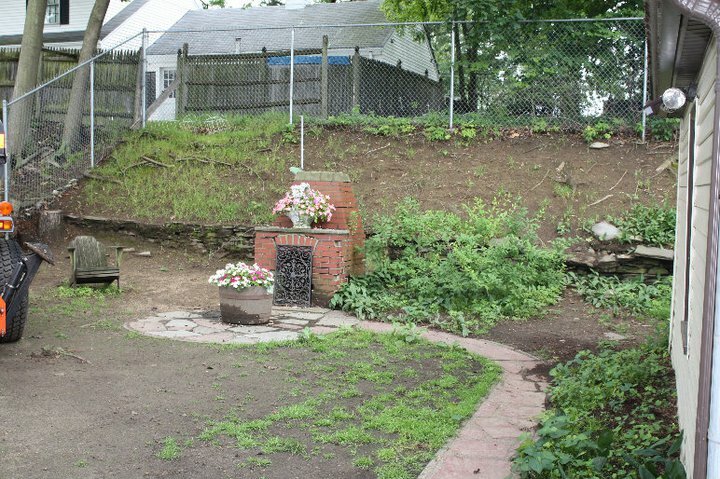 The backyard had been neglected for years and the owners decided it was time for a change. 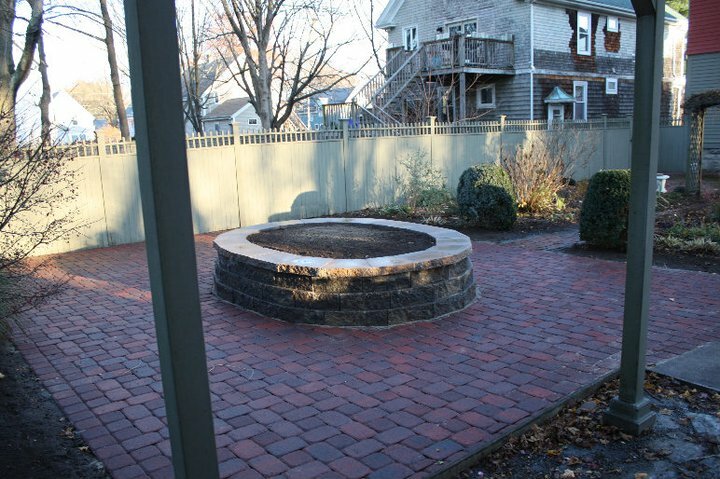 After a couple of meetings, we settled on a design that included increased entertaining area in the form of a brick patio, screening above the back fence and a garden for all seasons. 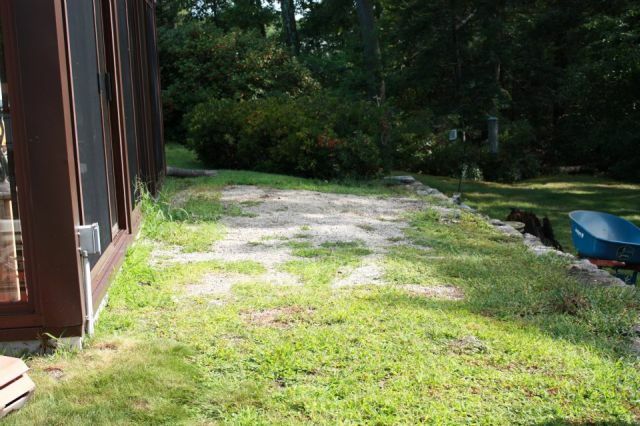 Several important windows in the back of the house looked directly into this area and we planned accordingly for great views. Sustainable native plants that would attract birds were also important to our clients. 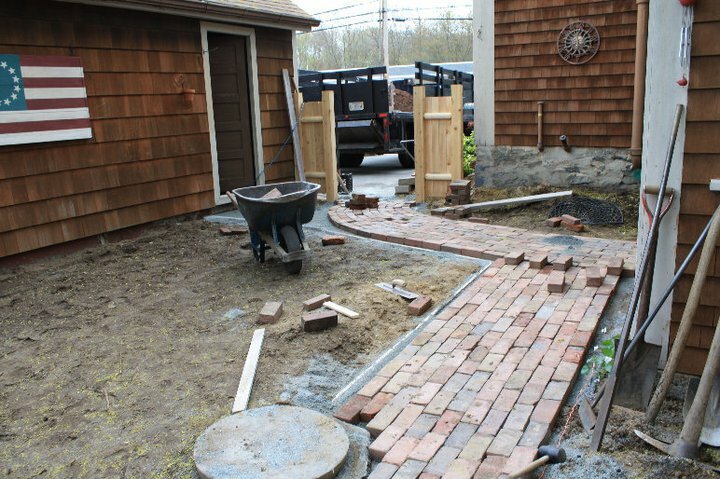 The brick patio connects to their side porch on one side and to the stone path we built that leads from their driveway on the other side. 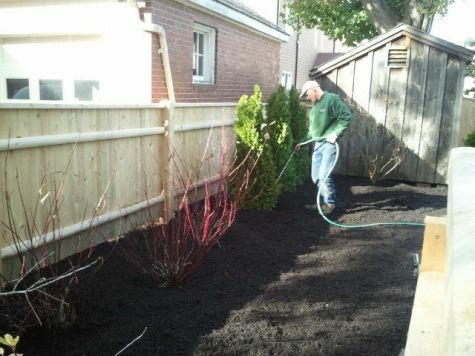 Plantings included Heritage® river birch, winterberry, spireas, hydrangeas, chokeberry, several viburnums, flowering crabapple, western red cedars and a Japanese maple. 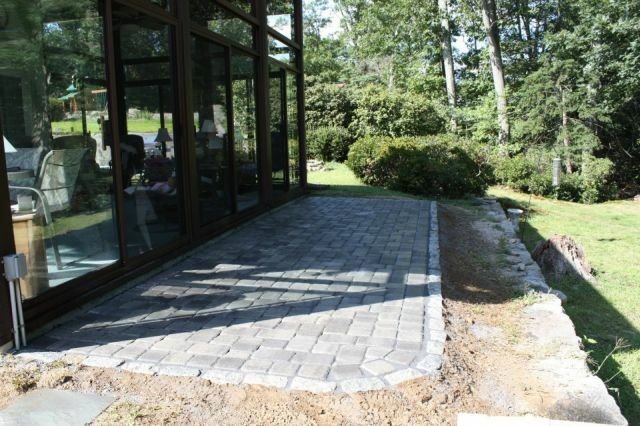 A paver patio edged in cobblestone was installed adjacent to a set of sliding glass doors that opens into a glassed-porch. 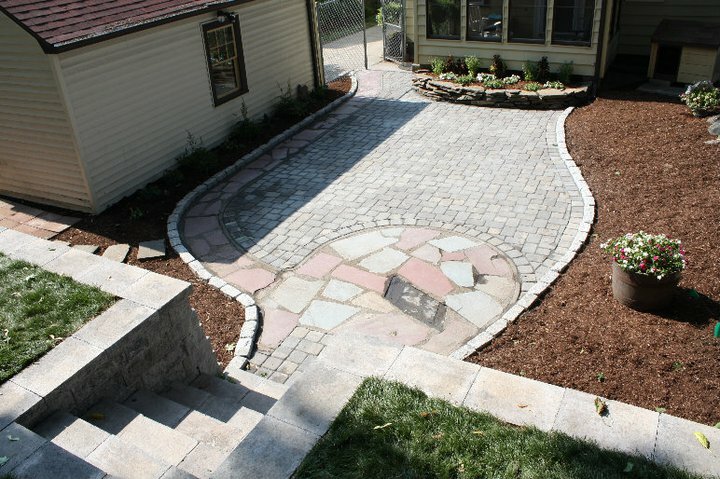 The cobblestone was set in concrete to prevent shifting of the pavers due to the slope of the grade at the edge of the patio. 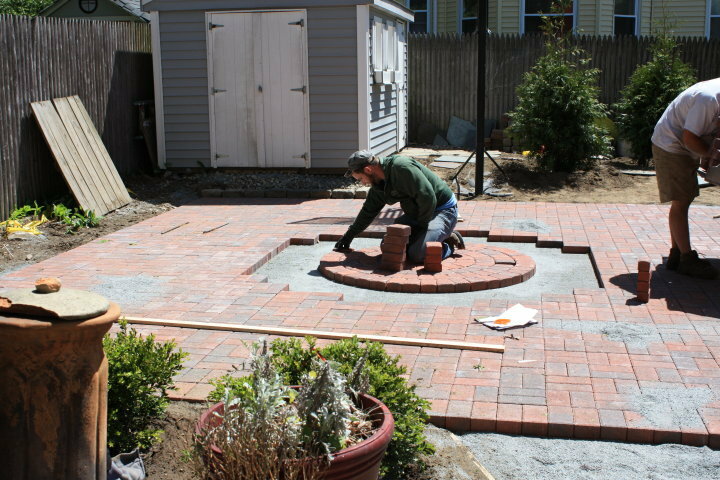 The patio will serve as a place for the outdoor grill and additional seating. 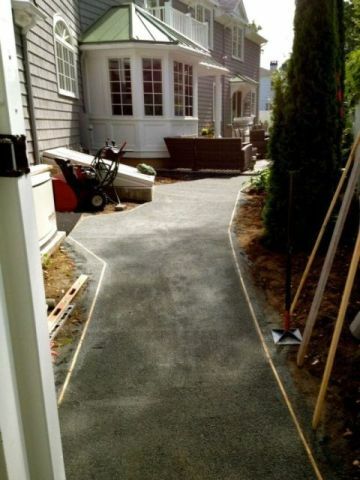 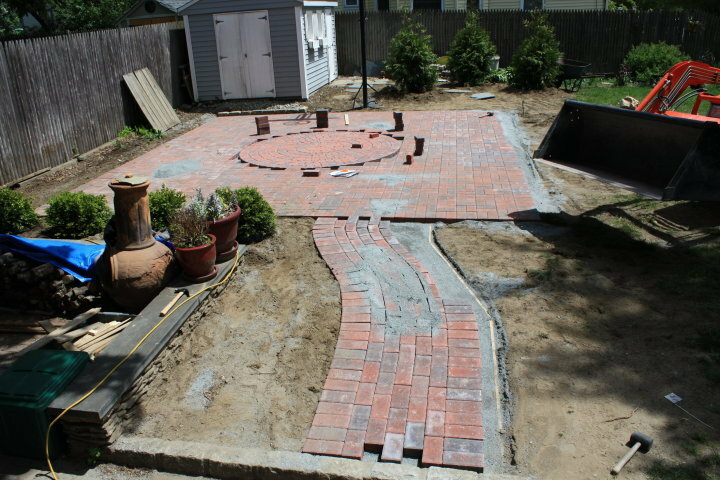 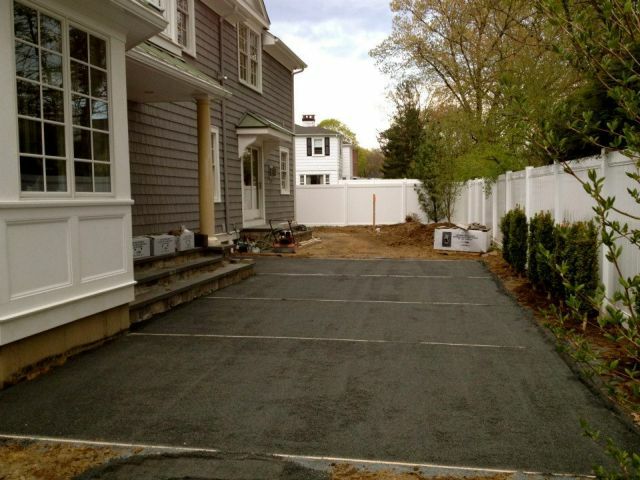 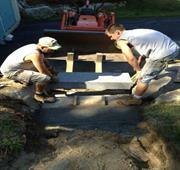 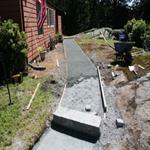 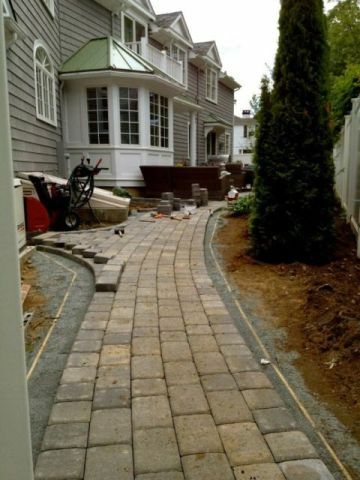 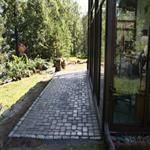 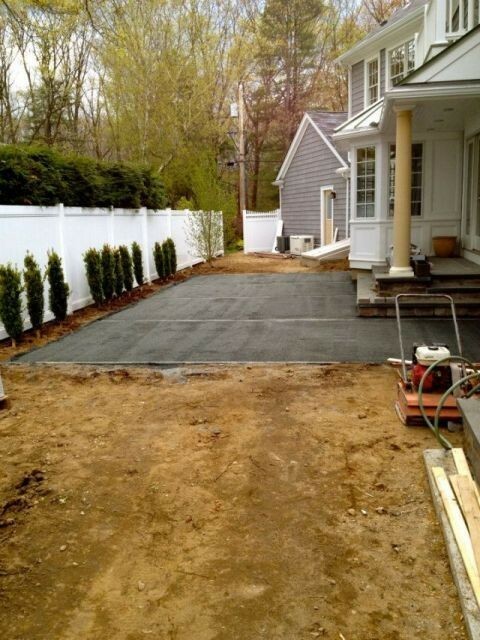 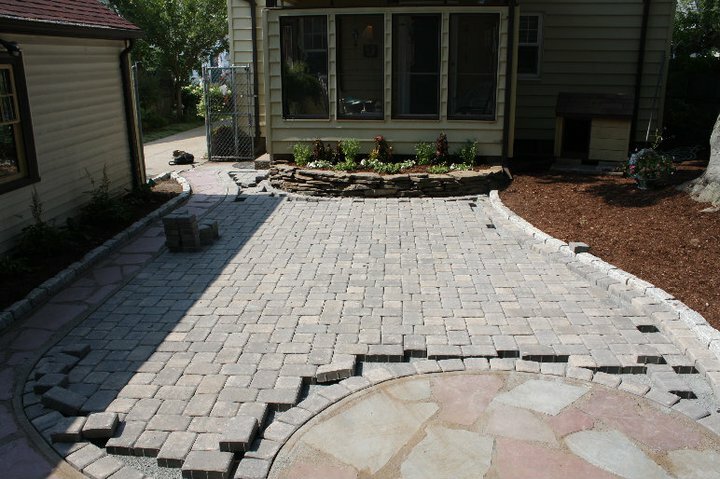 Using the same pavers, a walkway was installed leading from the driveway to the main entrance of the house. 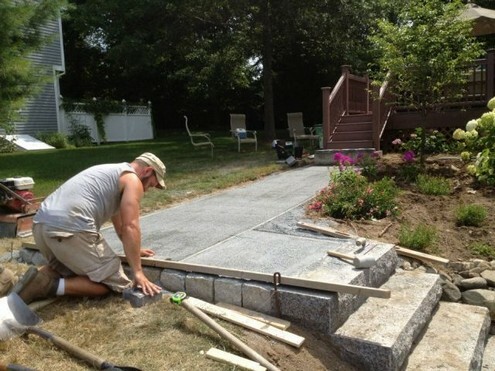 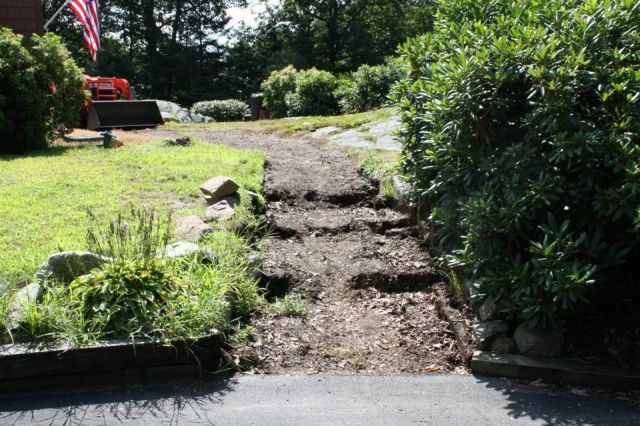 Several granite steps were installed to reduce the slope of the walkway due to the elevation difference from the driveway to the main entrance. 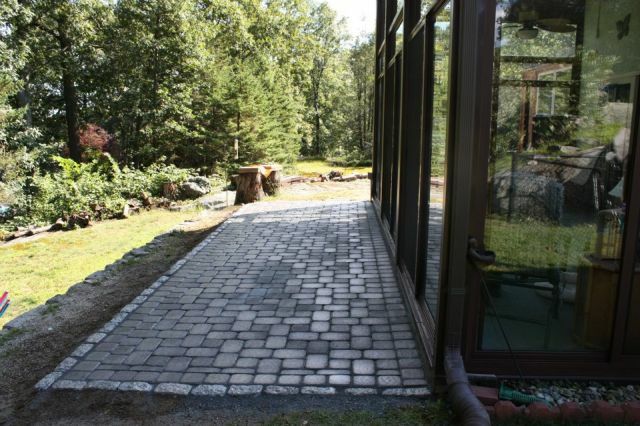 A darker granite called Caledonia was selected because it offered a more subtle color and blended with the outcroppings of natural ledge and nearby boulders. 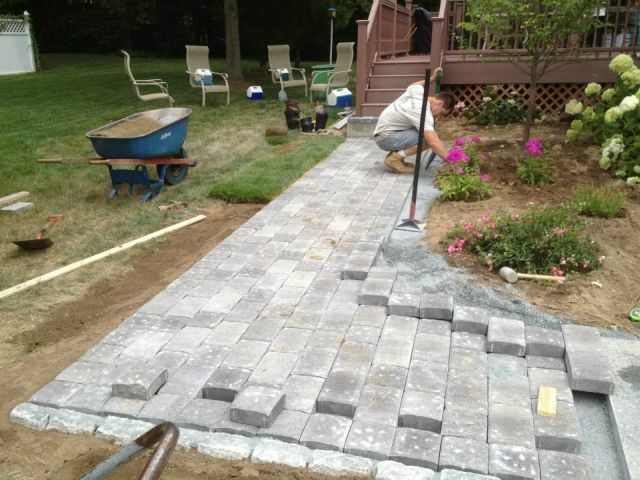 The border was highlighted using the same size paver along both edges. 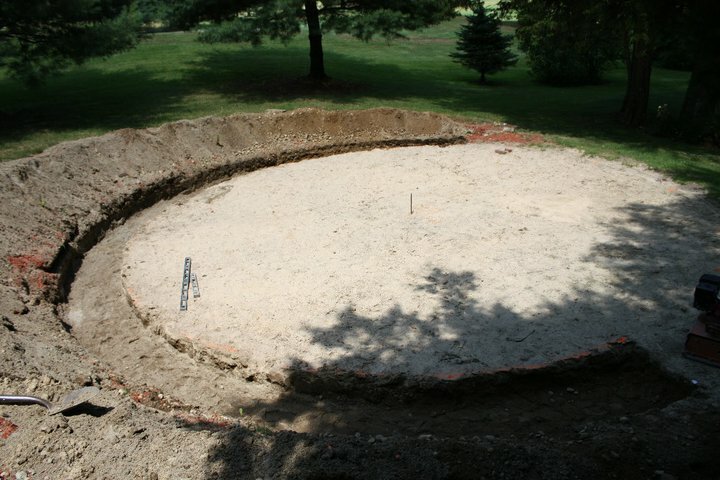 After the 23 foot diameter above-ground pool was dismantled and removed, I discussed with owners the idea of transforming the area into an outdoor living space. 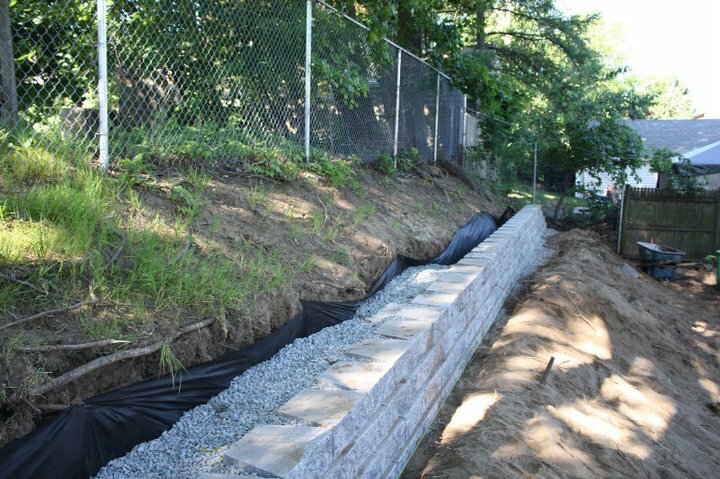 We built a sitting wall to retain the soil that originally sloped to the sides of the pool using a textured segmental block retaining wall system that enclosed approximately two-thirds of the perimeter of the patio. 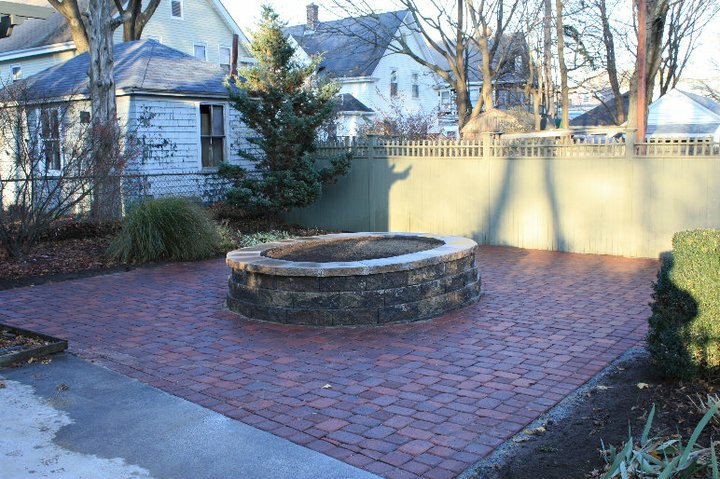 The patio was built with a concrete paver circular pack in a color to complement the wall color and surrounding natural features. 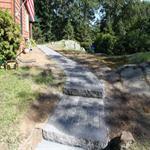 Granite steps were used to create a set of stairs from the lower lawn area to the front edge of the patio. 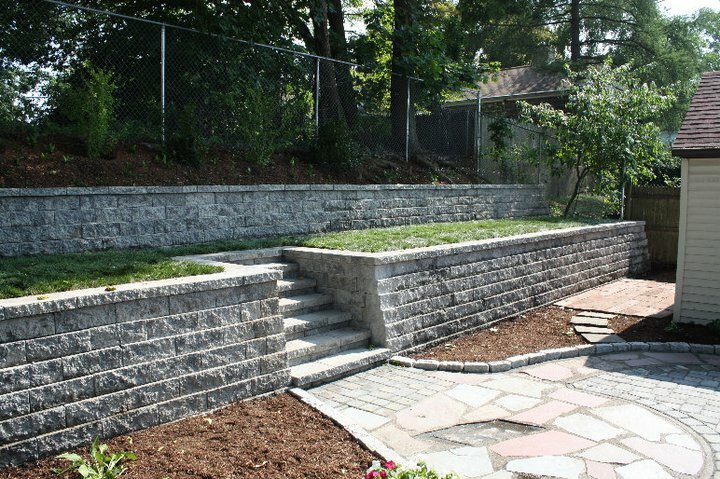 The 18” height of the retaining wall serves as extra seating as well as support the front face of a planting bed which wraps around the entire perimeter of the wall. 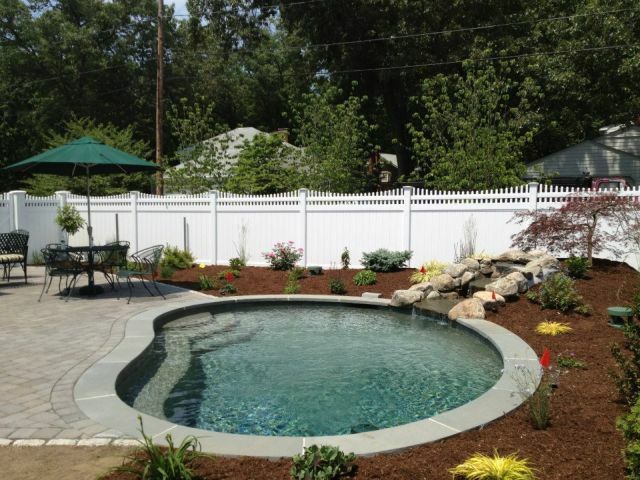 Shrubs, ornamental grasses and perennials were selected to provide color and foliage interest from late spring through the fall and include: hybrid spireas, endless summer hydrangeas, limelight hydrangea and knock out roses, coneflowers, Russian sage, dwarf daylilies and sedums. 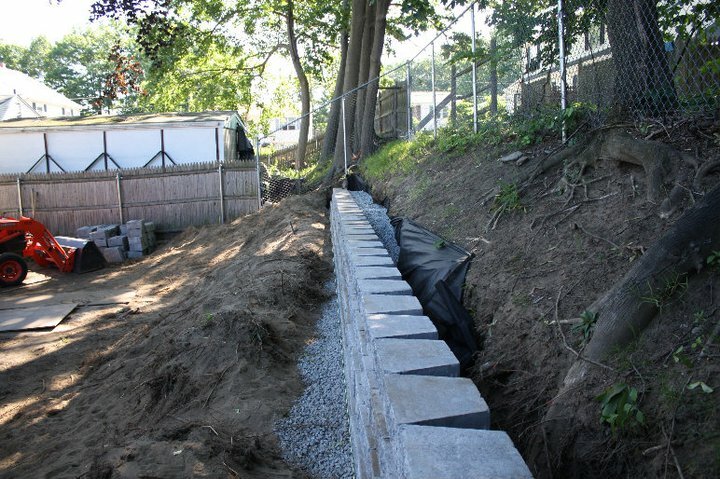 Using the tractor, we brought in over 20 tons of wall material (blocks and caps), over 25 tons of crushed stone and gravel, 250sqf. 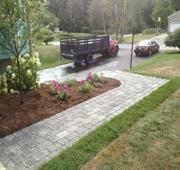 of pavers, 125’ of cobblestone, loam, compost, plants, and mulch. 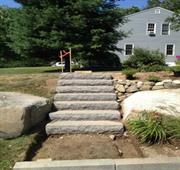 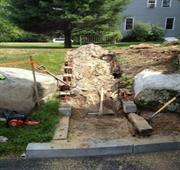 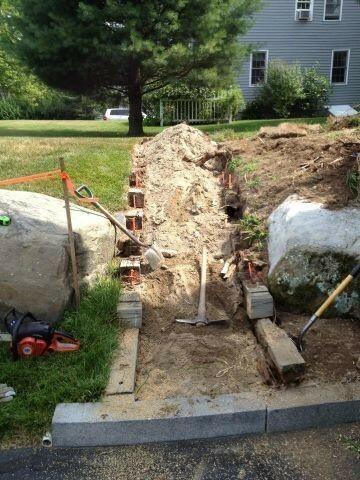 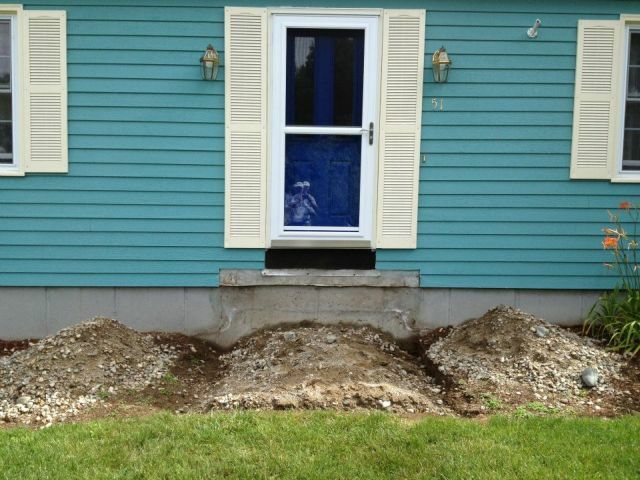 On this property in Attleboro, we replaced a set of stairs leading from their driveway to the backyard. 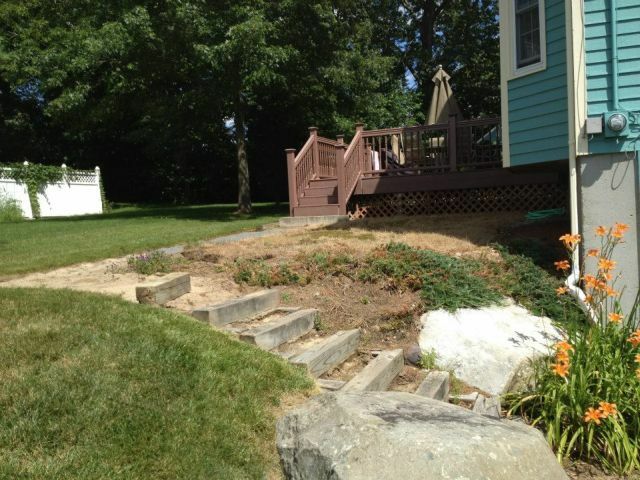 As can be seen from the before picture, the original stairs, like the front steps, were made using landscape timbers. 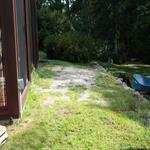 They also had rotted terribly and needed replacing. 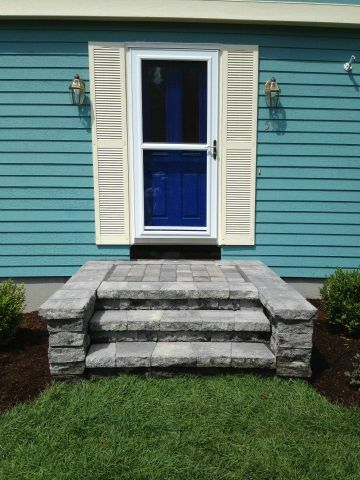 We chose to use the darker Caledonia granite steps (4 feet wide) to create the stairway, and a complementary grayish-blue colored paver to build a walkway from the top step to the deck off the back of the house. 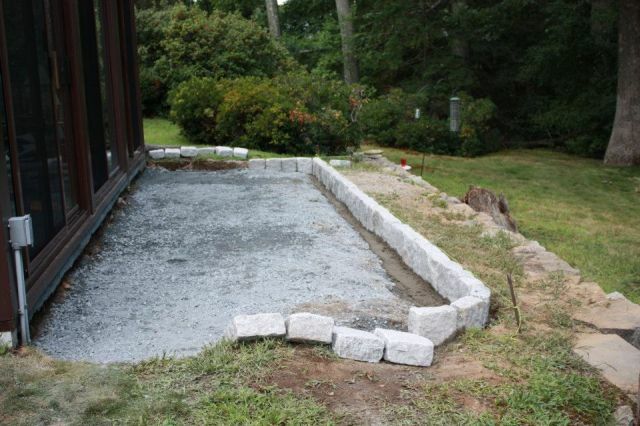 A late spring through fall garden was designed and installed between the walkway and the back of the house, the focal point of which was the small flowering tree - Japanese Snowbell. 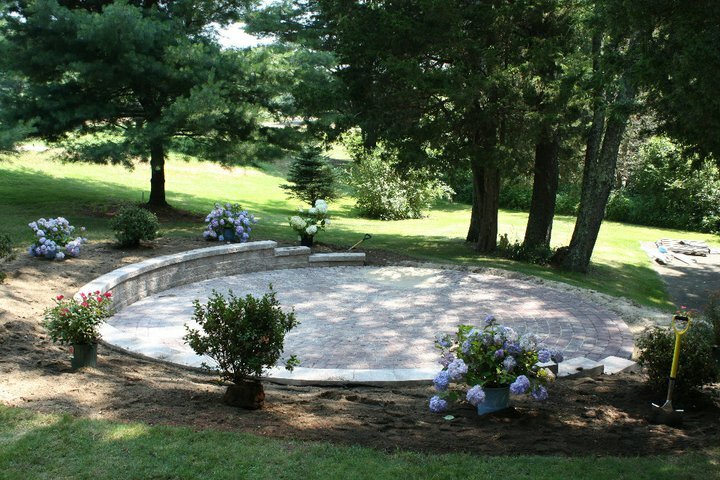 I chose this tree because when it blooms in June, the pendulous lily of the valley-like flowers hang on the underside of the foliage and is best viewed while looking up at the tree from a lower elevation, as will be the case when entering their driveway or climbing up the newly installed granite steps. 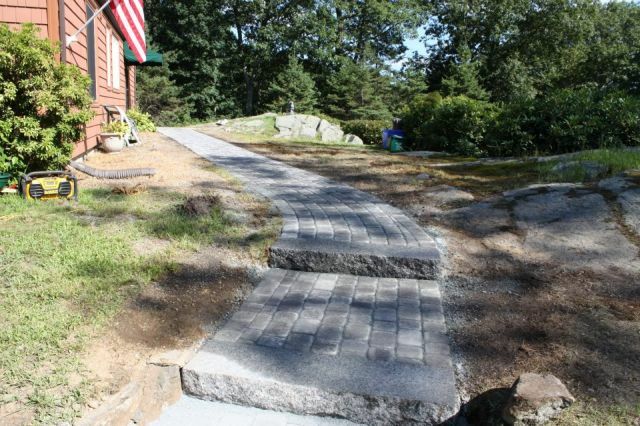 A darker granite called Caledonia was selected because it offered a subtler color and blended with the outcroppings of natural ledge and nearby boulders. 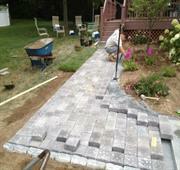 The border was highlighted using the same size paver along both edges. On the same property as above we replaced a set of stairs leading from their driveway to the backyard. 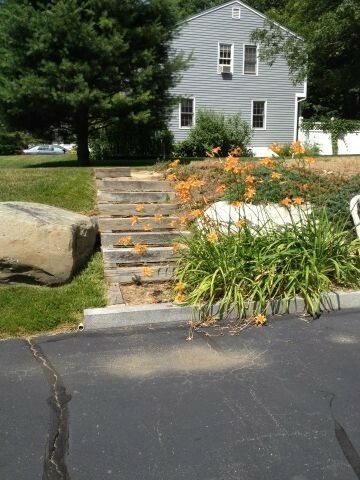 As can be seen from the before picture, the original stairs, like the front steps, were made using landscape timbers. They also had rotted terribly and needed replacing. 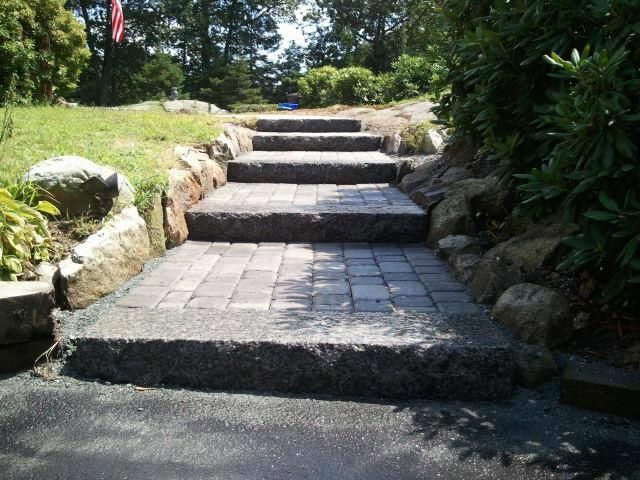 We chose to use the darker Caledonia granite steps (4 feet wide) to create the stairway, and a complementary grayish-blue colored paver to build a walkway from the top step to the deck off the back of the house. 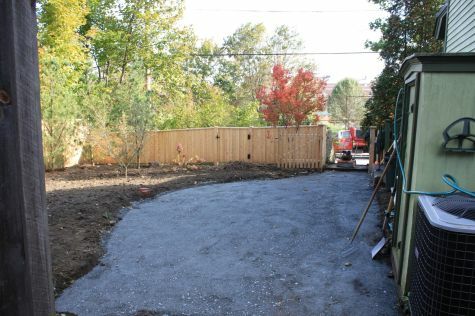 A late spring through fall garden was designed and installed between the walkway and the back of the house, the focal point of which was the small flowering tree - Japanese Snowbell. 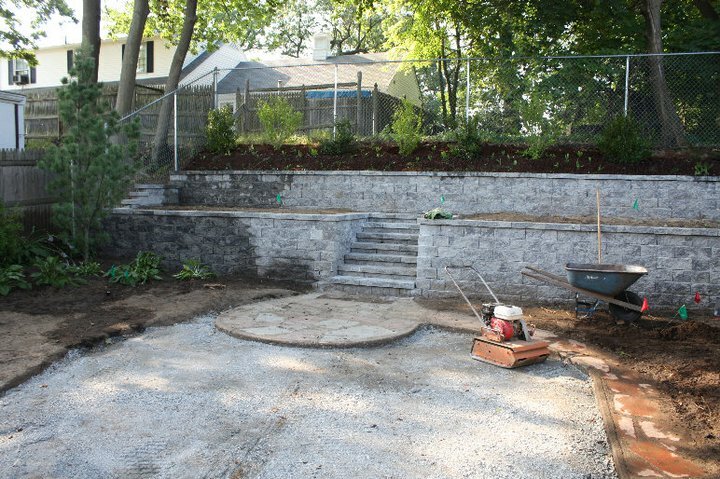 I chose this tree because when it blooms in June, the pendulous lily of the valley-like flowers hang on the underside of the foliage and is best viewed while looking up at the tree from a lower elevation, as will be the case when entering their driveway or climbing up the newly installed granite steps. 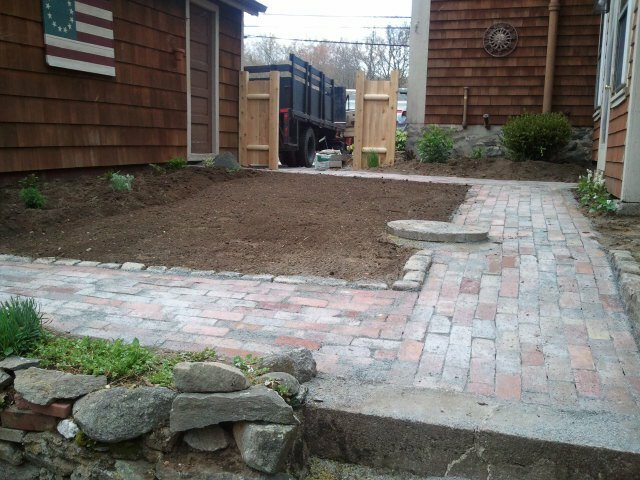 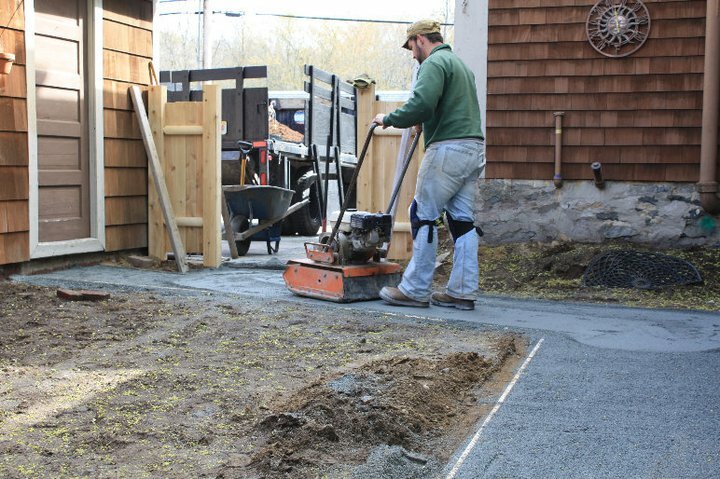 Using the tractor, we brought in over 20 tons of wall material (blocks and caps), over 25 tons of crushed stone and gravel, 250sqft of pavers, 125’ of cobblestone, loam, compost, plants, and mulch. 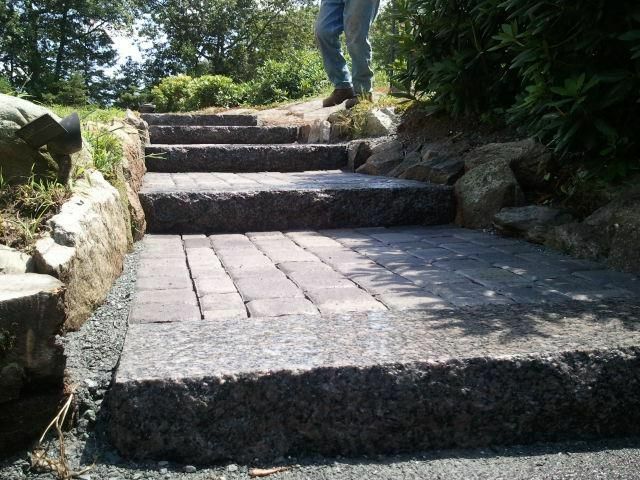 A darker granite called Caledonia was selected because it offered a sublter color and blended with the outcroppings of natural ledge and nearby boulders. 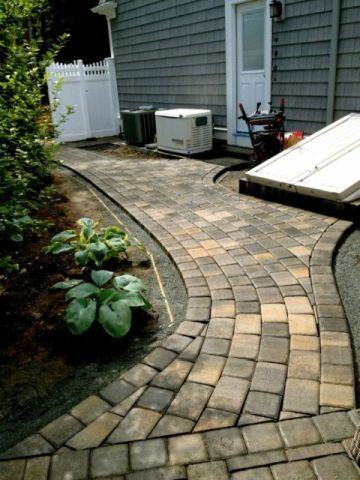 The border was highlighted using the same size paver along both edges.